This unique expedition crosses the Arctic Circle and includes the isolated and pristine Wrangel and Herald Islands and a significant section of the wild North Eastern Siberian coastline. It is a journey only made possible in recent years by the thawing in the politics of the region and the retreat of summer pack ice in the Chukchi Sea. The very small distance between Russia and the USA along this border area was known as the Ice Curtain, behind which then and now lies one of the last great undiscovered wilderness areas in the world. The voyage journeys through the narrow Bering Strait, which separates Russia from the United States of America, and then travels west along the Chukotka coastline before crossing the De Long Strait to Wrangel Island. There we will spend four to five days under the guidance of local rangers on the nature reserve. Untouched by glaciers during the last ice age, this island is a treasure trove of Arctic biodiversity and is perhaps best known for the multitude of Polar Bears that breed here. We hope to catch many glimpses of this beautiful animal. The island also boasts the world's largest population of Pacific Walrus and lies near major feeding grounds for the Gray Whales that migrate thousands of kilometres north from their breeding grounds in Baja, Mexico. Reindeer, Musk Ox and Snow Geese can normally be seen further inland. A visit to massive bird cliffs on nearby Herald Island is also planned. The ‘mammoth steppe' vegetation complex, a rich and diverse relic from the Pleistocene epoch nurtures over 400 plant species and never fails to astound visitors with its sublime beauty. The number and type of endemic plant species, the diversity within plant communities, the presence of relatively recent mammoth tusks and skulls, a range of terrain types and geological formations in the small geographical space are all visible evidence of Wrangel's rich natural history and its unique evolutionary status within the Arctic. 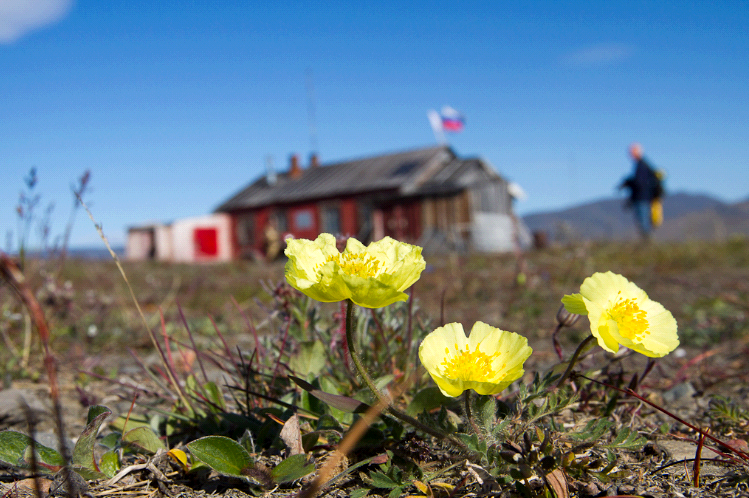 The human history of Wrangel Island is fascinating on its own. Highlights include a 3,400 year old Paleo-Eskimo camp in Krassin Bay, controversy over discovery and ownership of the island, the amazing story of the survivors of the Karluk, Ada Blackjack the heroine of the island, the Soviet occupation and militarisation and more recently, the establishment of this world class nature reserve. A host of similarly enthralling stories hail from several optional landings along the northern coasts of Chukotka. 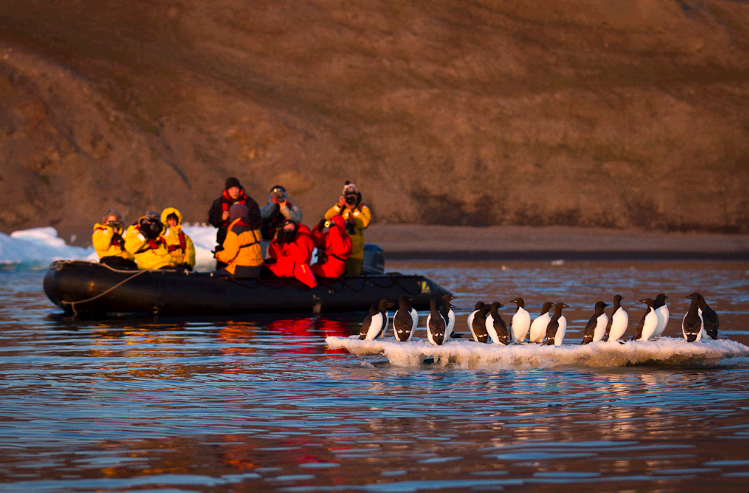 Our expert expedition team will take you on guided walks, Zodiac cruises and provide lectures to help you better understand and appreciate this unique High Arctic landscape. Exclusive Overland Experience - explore the interior of Wrangel Island by six-wheel Tundra vehicle, exclusive to Heritage Expeditions. The High Arctic environment that few people experience is now accessible on this 3 day- 2 night extension. You will travel by special tundra buggy, camp in field huts and enjoy wildlife encounters and photographic opportunities that professionals dream about. Read more here. Superior Plus Triple: One bunk (one upper and one lower berth) and one additional lower berth, writing desk, wardrobe and drawers. Private bathroom with shower, toilet and washbasin. These cabins have windows. Two lower berths, writing desk, wardrobe and drawers. Private bathroom with shower, toilet and washbasin. A large window offers great views. Separate bedroom with a double bed and a single bed or sofa in the lounge, writing desk, wardrobe and drawers. Private bathroom with shower, toilet and washbasin. A large window offers great views. Large lounge area, separate bedroom with double bed and a single bed in the lounge, writing desk, wardrobe and drawers. Private bathroom with shower, toilet and washbasin. Large forward and side facing windows allow great views. For those departing Nome, Alaska your adventure begins with a flight across the Bering Sea and International Date Line to the remote port of Anadyr. All expedition members will arrive in Anadyr; depending on your time of arrival you may have the opportunity to explore Anadyr, before getting to know your fellow voyagers and expedition team on board Kapitan Khlebnikov. We will depart when everybody is on board. At sea today, there will be some briefings and lectures. There is also a chance for some ‘birding’ and cetacean watching and settling into ship life. Later this afternoon we plan to Zodiac cruise some spectacular bird cliffs in Preobrazheniya Bay. Yttygran Island is home to the monumental ancient aboriginal site known as Whale Bone Alley. Whalebones stretch along the beach for nearly half a kilometre. Gray Whales are frequently seen around the Island, we will also cruise by Nuneangan and Arakamchechen Islands where seabirds nest and walrus can be found. Sea conditions permitting, we will land at Cape Dezhnev early this morning. The north-eastern most point of the Eurasian continent, it is sometimes possible to see the coast of America from this remote and lonely outpost. A few nautical miles to the west of Cape Dezhnev we visit Uelen Village, the most northeastern village in Russia. The population is predominantly Chukchi and the village is one of the largest centres for traditional Chukchi and Inuit art in the world. We’ll be entertained by villagers and visit the bone-carving workshop during our visit. This small island was once an important Russian Polar Research Station, and one of a number dotted across the Arctic. 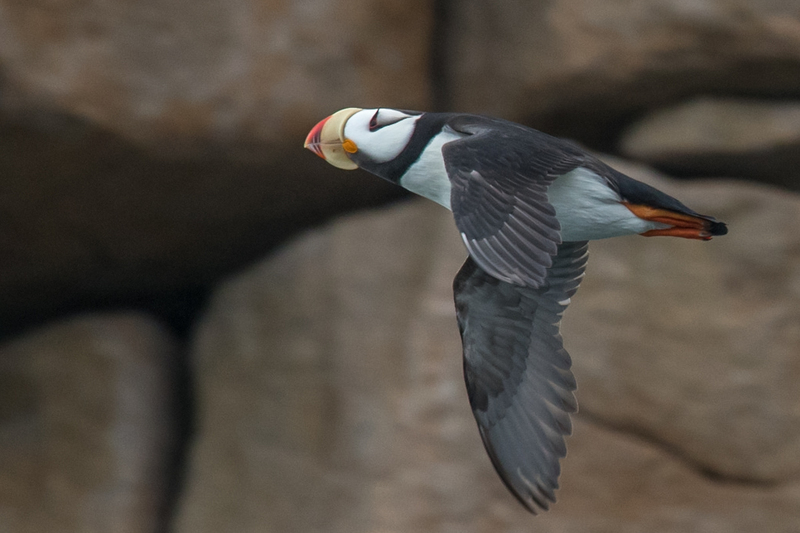 Near the derelict buildings are some of the most spectacular bird cliffs in the Arctic where puffins, guillemots and gulls can be observed and photographed up close. Ice and weather conditions permitting, we will spend the next few days on Wrangel Island and we will also attempt to include a visit to nearby Herald Island. There are many landings that we can make to search out wildlife, wild flowers and Arctic landscapes. Polar Bears will be high on our list of animals to see and with a little patience we should be rewarded with a number of encounters. Musk Oxen and reindeer were introduced to the island in 1975 and 1948, though reindeer numbers are low. We also have a chance to visit Dragi Harbour where the survivors of the Karluk, which was crushed by ice in 1914, scrambled ashore and lived until they were rescued. 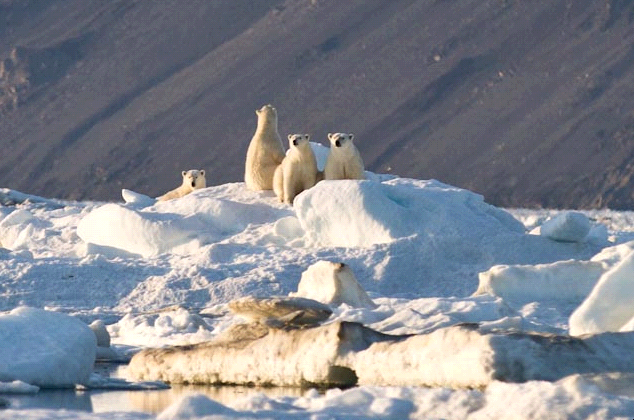 Wrangel Island is a Russian Federal Nature Reserve of international significance and importance, particularly as it is a major Polar Bear denning area. Also, each summer thousands of birds migrate here to breed including Snow Geese, Snowy Owls, skuas, Arctic Terns, Ross’s, Sabine and Ivory Gulls. Bounded by narrow sand ridges with numerous lagoons and inlets, this area offers plenty of places to land and explore this extensive coastline. We will be on the lookout for whales, walrus and other wildlife. We will see Chukchi villages whose residents survive in an unforgiving climate, hunting seals and whales just as their ancestors did. So huge that it is visible from satellite photos, this inlet contains vast numbers of waterfowl and migratory waders. We concentrate our visit on the Belaka Spit near the mouth of the inlet. It is a wild, desolate landscape that is strangely beautiful. We search the dunes and tidal areas for birdlife including Emperor Geese and Spoon-billed Sandpipers. Gray Whales frequent the area and are sometimes spotted feeding only metres offshore. Early morning we will pass the Diomede Islands, sometimes called Tomorrow Island and Yesterday Isle because they straddle the International Date Line. Here Russia and America are separated by only 2.3 nautical miles of ocean. We will remain in Russian territory as we cruise south past the islands. Later this afternoon we make an expedition landing on the Chukotka coast, our last chance to enjoy the wildlife and tundra landscape. Relax as we sail across Anadyrskiy Bay towards Anadyr. After breakfast it will be time to say our farewells. There will be a complimentary transfer to the airport or to a central downtown hotel. The latest addition to Heritage Expeditions' fleet, legendary Russian icebreaker and former research vessel Kapitan Khlebnikov holds the passenger ship record for the most crossings of the Northwest Passage and has famously circumnavigated Antarctica - twice. 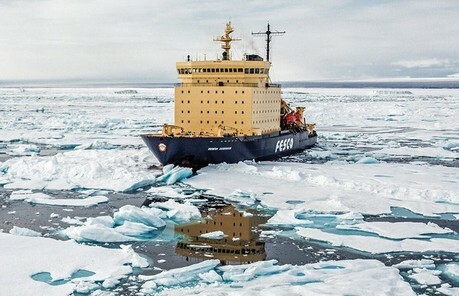 Built in 1981 by Finland's Wärtsilä Company and one of four Kapitan Sorokin-class icebreakers, Kapitan Khlebnikov wraps comfortable surrounds in a formidable, ice-reinforced vessel powered by 24,000 horsepower diesel-electric engines and is capable of breaking ice as thick as two metres. Recently refurbished, Kapitan Khlebnikov comfortably accommodates up to 110 guests in well-appointed and spacious cabins and suites all featuring large windows that can be opened and en suite facilities. Common areas include large open decks, two dining rooms, a digitally equipped theatre-style lecture room, heated indoor pool, sauna, gymnasium, fully-stocked library, bar, lounge and four-person elevator. The real focus and emphasis of every expedition is getting you ashore as often as possible for as long as possible with maximum safety and comfort. Our Expeditions are accompanied by some of the most experienced naturalists, botanists, historians and guides, who have devoted a lifetime to field research in the areas that we visit. The ship is crewed by an enthusiastic and experienced Russian Captain and crew. Heritage Suites: Large lounge area, separate bedroom with double bed and a single bed in the lounge, writing desk, wardrobe and drawers. Private bathroom with shower, toilet and washbasin. Large forward and side facing windows allow great views. Mini Suites: Separate bedroom with a double bed and a single bed or sofa in the lounge, writing desk, wardrobe and drawers. Private bathroom with shower, toilet and washbasin. A large window offers great views. Superior Plus cabins: Two lower berths, writing desk, wardrobe and drawers. Private bathroom with shower, toilet and washbasin. A large window offers great views. Superior Plus Triple: One bunk (one upper and one lower berth) and one additional lower berth, writing desk, wardrobe and drawers. Private bathroom with shower, toilet and washbasin. A large window offers great views. The wharf on the eastern side of the Anadyr River was the starting point for this expedition with guests arriving from yesterday (for those who had travelled from Nome) and others from Moscow to meet on the Spirit of Enderby, otherwise known as Professor Khromov, ready for an exciting two weeks exploring this little-known region of the Russian Far East. Once all were assembled it was time to settle in, get acquainted with the ship and fellow guests, and for Helen, the Expedition Leader, to give the welcome presentation and a safety briefing. Following the briefings we were able to take advantage of a break in the grey weather and enjoy the many Beluga and Spotted Seals just of the side of the vessel all actively hunting for Salmon which were running the turbid waters upstream. Amongst the many white adult Beluga’s were a number of greyer immatures. One animal bore the scar of a Polar Bear attack with large claw marks along its flanks. Early evening came and we got to put what we had learnt in the safety briefing into action with a lifeboat drill, something that we hoped we wouldn’t have to do for real at any point! After the first of many delicious evening meals the tide turned and with slack water the ship moved away from the wharf at 2020 under the supervision of the pilot and headed downstream and towards the open ocean. Our voyage began. Our first morning on the ship started with a hearty breakfast followed by a couple of lectures. Oksana introduced the Beringia National Park and the wildlife protection system in Russia and was followed by Helen with an introduction to Presbrazhenya cliffs, our destination this afternoon, as well as a briefing on the Zodiacs so we were all familiar with what to expect. The morning cruised by, the ship ran fast and before we knew it, it was lunchtime and we were arriving at the spectacular Presbrazhenya cliffs. A south-westerly swell raised the fear we may not be able to cruise but these were alleviated when we arrived in the bay and the captain tucked the ship in just out of reach of the main swell. We launched all five Zodiacs and headed across the bay to the base of the cliffs. Swell surged up the rocks funnelling up the fissures and intrusions with immense force and obscuring the Zodiacs with giant rolls. The seabirds above us seemed completely unconcerned. A vast natural seabird city adorned the monumental cliffs. Black-legged Kittiwakes clamoured and squabbled from their splash-zone nests, chicks peaking down to these mysterious rubber shapes in the water. Brunnich’s and Common Guillemots lined the ledges and above them Tufted Puffins peppered the upper grassy banks. 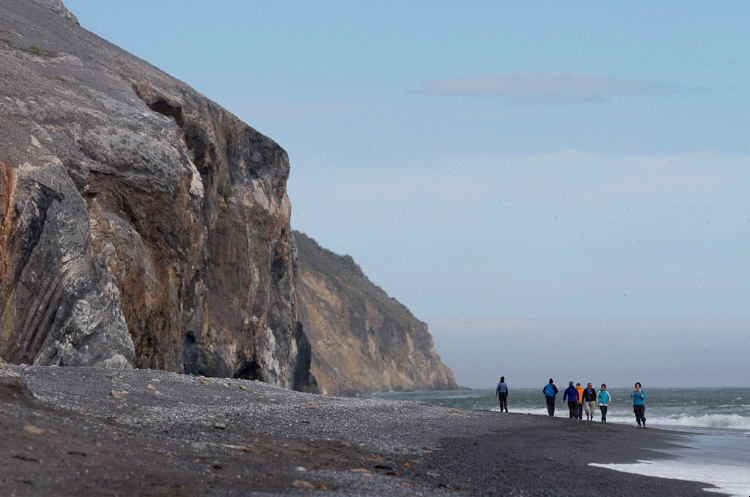 The boulder scree provided a refuge for Parakeet and Crested Auklets which swirled in dense flocks above the stark landscape. 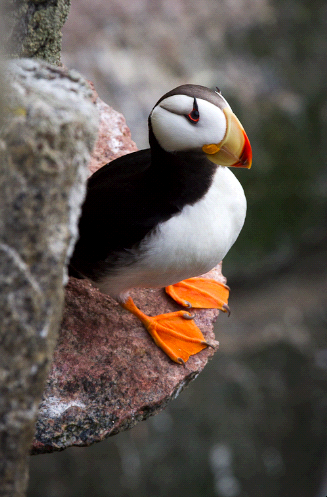 Careful searching revealed Horned Puffins and Pigeon Guillemots making crevices and cracks their home. Ever alert, Glaucous Gulls and Ravens patrolled the cliffs ready to seize unattended eggs or chicks. It was all-action. To witness such a hive of active from the surface of a churning ocean provides a completely unique perspective and made our Zodiacs seem very very insignificant in such a landscape. Having enjoyed the cliff spectacle we motored across the eastern side where the lee of the cliffs provided shelter from the swell. Here a colony of Glaucous Gulls complete with beady-eyed juveniles objected to our presence with angry tones and the odd fly-by whilst the Horned Puffins seemed to find more tranquillity in the fracturing stacks and crumbling cliffs. With the afternoon drawing to an end we motored back to the ship, raised the Zodiacs, heaved the anchor and headed east towards the Bering Strait. 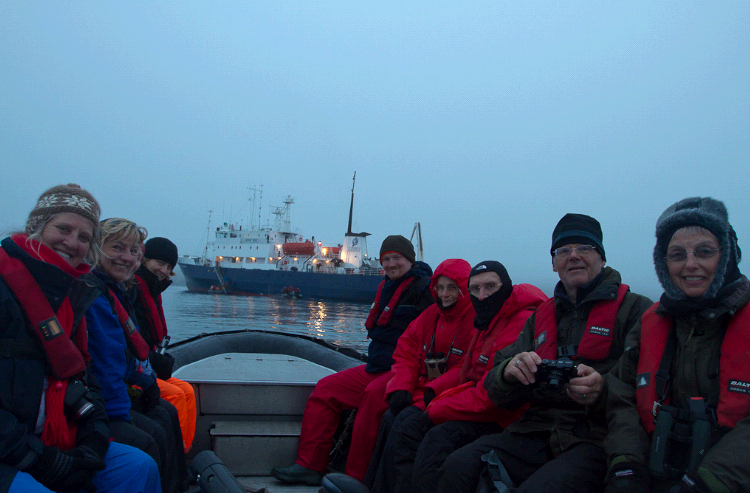 Arriving at Yttygran Island we found calm overcast conditions, perfect for a landing to explore Whalebone Alley. Shuttling ashore we met the two Vassili's and Ivan who provided us with an in-depth explanation of the history of the site, the structure of the village and the way of life that would have occurred here many years ago from the significance of the Bowhead Whale jaw bones standing upright to the meat pits excavated into the base of the scree slope. One can only imagine what it must have been like 500 years ago staring out across the sound, launching a small skin boat and heading off to hunt for whales. 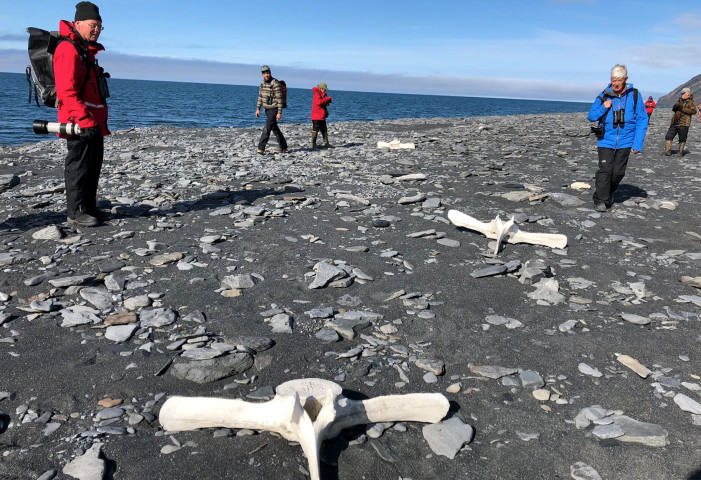 Following the fascinating insight into life at Whalebone Alley, guests were free to roam, take photos, enjoy the Arctic Ground Squirrels or stretch the legs and head up the hill. With the cloud dropping and the rain starting we headed back onboard for a warming drink, some lunch, and to reposition the ship up the coast to Gil’mimyl. Gil’mimyl is a fascinating place with something for everyone. Once again we shuttled into the small lagoon on the Zodiacs landing on the shore where we had the option of joining several groups. Elena lead a group out over the tundra in search of edible plants, Dan strolled along the edge of the river scanning for birds, both the latter groups ending up at the hot spring, Rachael made a beeline straight for the hot pool and Oksana remained close to the landing location with Ivan, a local Chukcki man who had set up his Yarunga and created a beautiful spread of food for us to try including smoked and fried salmon, fried bread and salad. A well-used black kettle hung from the structure over a wood fire, the scent clinging to us as we slumped back into the cosy Reindeer pelts laid out on the floor. Along the river the birders had found Red-necked Stints, and Eastern Yellow and White Wagtails, whilst in the river itself the Pink Salmon (Humpies) had already started running with large pinky-brown fish darting up the shallows, their exaggerated humped dorsal ridges and fins cutting the water with a burst of speed. As we approached the hot springs the ground was steaming and fine dew condensed on the grass growing along the hot flushes. Here a wooden hot tub has been dug into the ground where fresh, bath-hot water runs directly into it. For a brave few the ice-cold waters of the adjacent river proved an enticing prospect and a great way to cool off! After a very enjoyable few hours ashore the rain finally arrived, we said our goodbyes to Ivan and made our way back to the ship. The silhouette of Lavrentiya lay angular at the back of the beach in front of us. Soon after breakfast we shuttled ashore before re-grouping on the shingle beach at the front of the town and making our way firstly to the Pelikan statue where a quick rub of the belly should have given us all some extra luck. Our time in Lavrentiya was then divided between the museum and outside the community centre. At the latter a superb platter of local delicacies has been prepared for our consumption from smoked salmon to salted Gray Whale, boiled walrus and a variety of cakes laced with tundra berries, all washed down with a cup of warming tea. In the museum we were shown the variety of amazing artefacts from Chukchi and Yupik life each with a fascinating story behind it. Meeting back at the community centre a superb dance performance was put on for us whilst we continued to enjoy more food and drink and for those with a little energy engaged in a game of Eskimo hand ball. The morning had been a fascinating insight into local life and no doubt offered something new for all of us. We left Lavrentiya and moved northeast up the Gulf and out into the Bering Strait passing a number of Gray Whales actively feeding in the shallow waters and many hundred of guillemots and auklets. Oksana delivered a superb lecture about Naukan, the abandoned Yupik village we were heading for at Cape Dezhnev and as we entered the narrowest part of the Bering Strait Rakmanova (or Big Diomede) stood proud on the horizon. The sea and weather looked promising for a landing at Cape Dezhnev and a scout boat was launched. We were in luck. The swell was minimal and a landing was on. With everyone gathered onshore Oksana was able to lead on along the beach and up into the abandoned village of Naukan, past old meat larders and circular huts, the whalebone ribbed roof now collapsed. 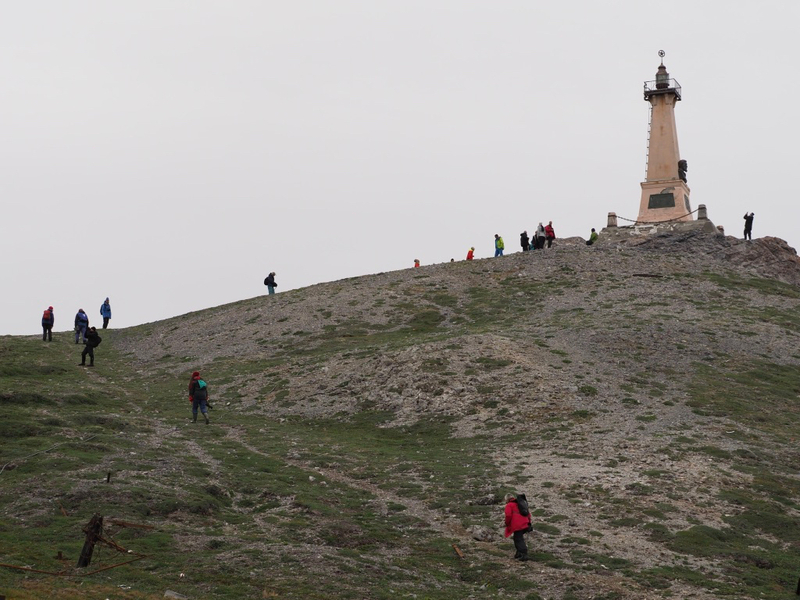 The walk continued to the newly erected bell and up to the monument and bust of Dezhnev from where the views were all encompassing; even the distant peak of Prince of Wales Land, mainland Alaska was visible. Birds streamed through the Bering Strait like grains of sand through an hourglass as the light slowly ebbed away. We made our way back to the ship after a long and packed day. After an evening rounding the eastern most part of Eurasia, we crossed the Arctic Circle and awoke to find ourselves in the Chukchi Sea, bouncing around in 20 knots of wind. We were unsure if we were going to be able to make a landing in the wind, but as soon as we approached Kolyuchin Island, we saw that it might be possible to find shelter in the lee. At nearly the same moment, we spotted a walrus haulout and took a tour around the island to watch walrus from the ship and keep an eye out for Polar Bears. In the lee of the island, the captain and Expedition Leader found a suitable anchorage to launch the Zodiacs and we all got to take a tour of the cliffs along the western side of the island where many Horned Puffins, guillemots and Pelagic Cormorants were nesting. Many of the birds were closer to the water than at Presbrazhenya Bay and thus we were able to get good views of the birds with our bare eyes. We all hopped back onboard and after another delicious meal prepared by Lance and Bruce, we cruised out to a shallow bank in search of whales. Loads of shearwaters were about and soon enough blows were seen in the breeze. On approach, it turned out to be a group of Bowhead Whales. It was a special opportunity to see these giant, slow moving animals. As the whales spread out to continue feeding, we set sail for Wrangel Island, still roughly 170 nautical miles away. As we slept, the ship sailed north-northeast, and toward Wrangel Island. The wind died down and curtains were pulled to a foggy but glassy sea surface. As we were still pushing north we got one last sleep in before the excitement of Wrangel “expedition days”, and the morning kicked off with a presentation on Polar Bears, wait, no, there were Polar Bears spotted on the ice and everyone rushed outside to see a mother and two cubs on an ice floe. The ship edged closer and eager eyes met curious bears. As we approached, the three bears all came to the ice edge, and with wonderful reflections, puzzled over what may have been their first ship sighting. The mother had been tagged, likely in Alaska, and had made its way back to the area to feed with her cubs. It was a delight to see such fat, healthy bears. After the bears, and the postponed presentation of bears, we got lunch before heading out to make our first landing on Wrangel. Sea ice dotted the calm surface as we dropped off builders and the director of the Wrangel Island Reserve, and soon after lunch everyone caught a ride over to Doubtful Bay. 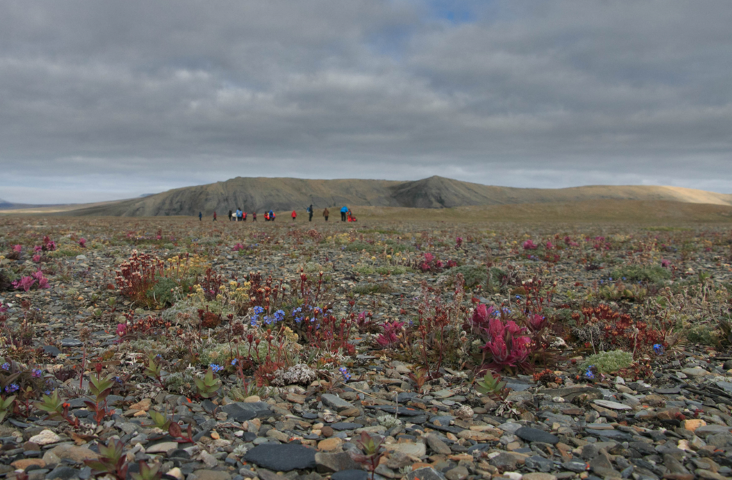 We split into ranger-led groups and walked among the old buildings and an array of blooming arctic flowers. The flowers added a splash of colour to what would have otherwise could have been a fog shrouded landscape dotted with rusting machinery and broken buildings. Hundreds of Snow Geese were seen in the distance, dotting the landscape in what could have been snow patches. The first group of overlanders were left onshore in the care of the rangers and Elena, and the ship set sail for the next day’s landing on Wrangel Island. A sunny day in the arctic is always welcome, and as we cruised up to Cape Fomy the fog lifted, and Wrangel Island emerged once again from the mists. Polar Bears dotted the hillsides, and we scanned the shoreline and in conjunction with the Wrangel Island Rangers aboard, decided to make a landing. Once ashore we split into three groups, going for a long, medium and short stroll along the shoreline. We all set off from the monument to the Russians who planted the first flag on Wrangel Island in 1911 from the ship Viagach. The Island has been under Russian stewardship since 1916 when the Tsar’s government declared Wrangel to belong to Russia. While walking we kept a close eye on the bears, and spotted numerous birds on the lagoon near shore. Near the end of the walk, those on the long walk were made aware that there was a bear swimming to shore in their direction. For some reason, the bear decided not to continue to shore, and a speedy departure was made by Zodiac. After refueling onboard, we set off up the coast to make a landing and nice walk at Sovetskay River. All went ashore for a good walk on the tundra, and again, bears were seen inland. Most got a chance to see a mother and two older cubs laying and resting in the sunshine. This was an ideal location to see a classic polar environment with sparse vegetation, bears and migratory birds. It was one of those “unconditional days” when the fog covered the ship and we had to be creative. So, what do normal people do in such a sad day – they watch movies and read book, having a cup of tea and a cookie next to the chair. Right after the breakfast Oxana gave a lecture about whaling in Chukotka based on her recent educational project about the first Soviet whaling fleet “Aleut”. She also shared her research on ancient aboriginal whaling that began 2,500 years ago as indicated by the rock carving in Pegtymel River near Pevek whisp where paleo Eskimo harvested Bowhead, Humpback and Gray Whales. We learnt about Soviet industrial whaling fleets in the Russian Far East and the exceptional captain of the last catcher-boat “Zvyozdny” Leonard Votrogov. He contributed a lot to Chukotka writing articles on whales, helping local Eskimo and Chukchi people with supplies, and confirmed that Chukotka waters had enough Bowhead Whales to instigate aboriginal whaling of this species again. Contemporary aboriginal whaling still occurs in Chukotka with around 350 whalers in 14 communities using 78 motor-boats. 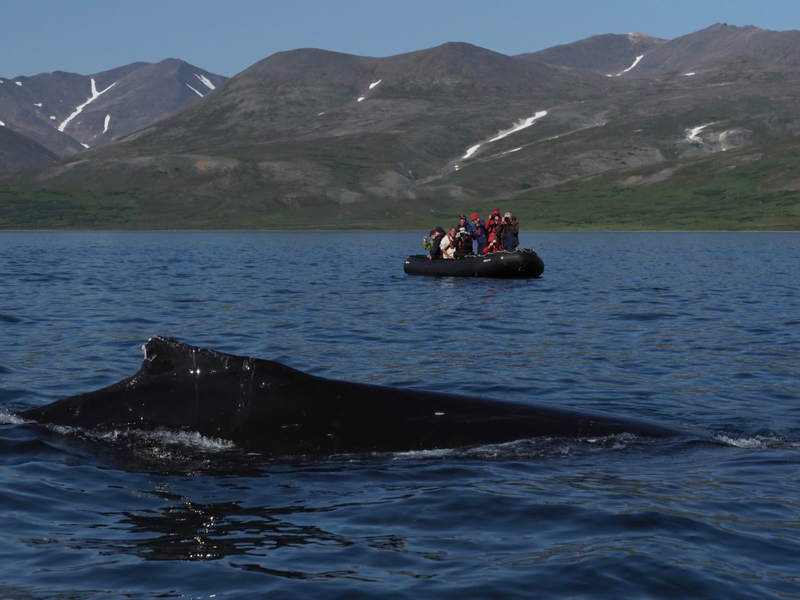 Subsistence whaling helps natives of Chukotka to maintain their lifestyle and identity. The fog remained thick all day meaning that a very controlled landing was the only possibility at Dream Head. Here we were allowed to wander within a carefully monitored area to avoid any unnecessarily close encounters with Polar Bears. The second group of overlander passengers swapped around with the first boarding the ship for a well earned cuppa and shower! We pulled away from the coast, a chance for those who needed a retail fix to indulge in the sea shop and as we headed north and past 70o the fog cleared and the sun came out. Gently pushing through ice we stumbled across a couple of obliging bears, one slowly meandering across its ice flow to inspect the ship, the second staring at a seal breathing pool waiting for something to appear. The golden evening light cast a beautiful hue across their fur and their breaths puffed orange in the cold air. The fog and low cloud spared us an early wake up call as we sat at anchor just off Herald Island. After breakfast we Zodiac cruised the coast checking out a couple of walrus haulouts in the caves. We searched along the coast to the northern tip of the island pushing through some choppy waters and a cutting wind to enjoy Horned Puffins, Black Guillemots and the striking geology of the island before returning to the ship. Lifting anchor we headed west and back to Wrangel where we were greeted by more ice packing in along the eastern coast. Coming into Dragi Bay, the site of the monument to the Karluk, we launched the Zodiacs and cruised between the ice floes exploring the rocky headland, ice caves and then along the beach where a large Polar Bear strolled down the bank towards us slipping into the water and out on to the floes. The monument was just visible in the thick fog which unfortunately prevented a landing but it was still great to get amongst the ice. Heading back to the ship the Zodiacs had to breakthrough the ice floes to a clear area of water for us to be able to embark the ship. As evening fell we headed off south around the coast and further out to sea encountering yet more ice. At the same moment the fog cleared and the sun appeared revealing a stunning female Polar Bear and her two cubs. The light was stunning, the bears sublime. One of the cubs plucked up the courage to come and see what the ship was and was promptly followed by the female and second cub with all three strolling right up to the bow only feet from some very wide-eyed passengers. It’s not every day you get to make eye contact with a family of Polar Bears. Taking care not to influence their behaviour further we gently pulled away from the ice leaving them watching us. We anchored at Krasin Bay just in front of Devil’s Creek, a 3,500 year old Paleo-Eskimo site. Archeologist Nikolay Dikov came to this site in 1975 and worked here over four field seasons. His team discovered middens containing the remains of walrus, Polar Bears, Reindeer, seals and birds and it was thought to be used as a hunting camp. The Devil’s Creek is also known for its geographical line, the 180th meridian, which divides the island on the Western and the Eastern Hemispheres. The weather was superb, one of those hazy, warm early autumn days. The night before had been cold and fresh pancake ice patterned the surface of the bay between small floes. Onshore the tundra was starting to flush yellow and red and the sweet smell rose from the ground. Overhead skein after skein of Snow Geese flew south along the coast punctuating the otherwise silent scene. 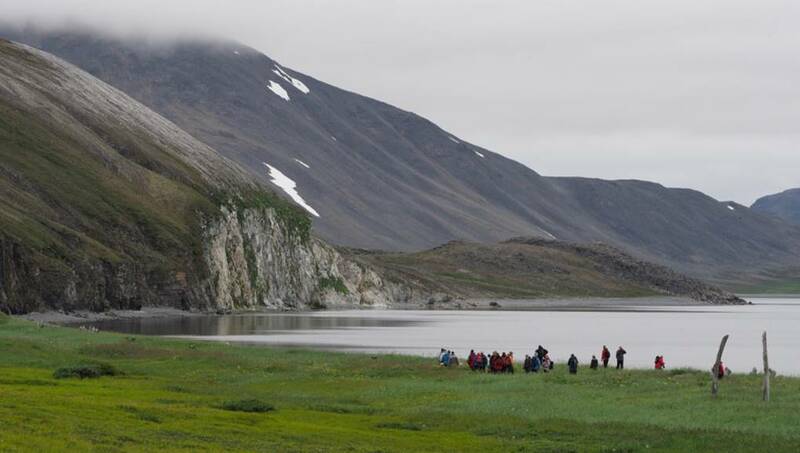 With everyone ashore we split into three groups, one to explore the Paleo-Eskimo site, a long-walk group who headed up to the ridge, and a medium walk which headed out in search of Snowy Owls and Long-tailed Skuas. All the walks enjoyed the later blooming flowers and the birders located their Snowy Owls, a pair perched high on the ridges. A Long-tailed Skua did a close fly by before landing on its lookout bluff. 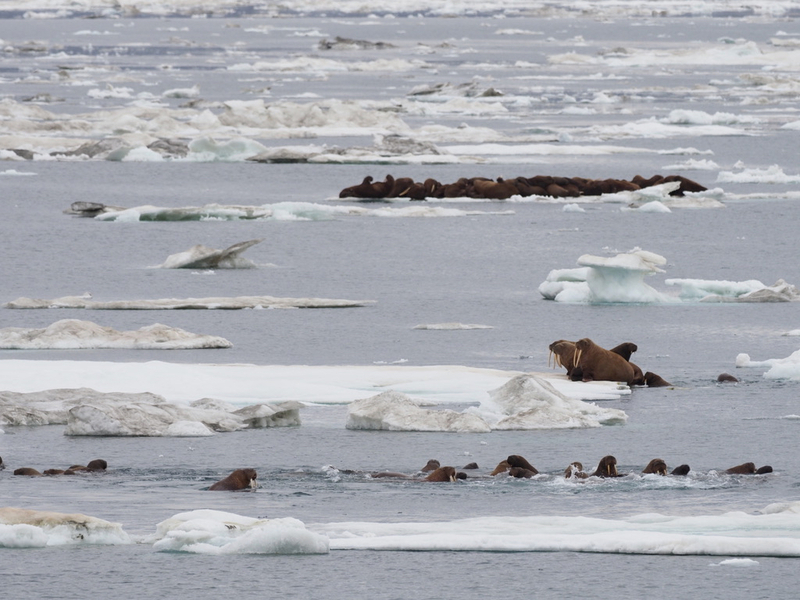 Through the silent air we could hear distant walruses out on the ice bellowing to each other and as we upped anchor and headed east we encountered several hundred scattered on the floes with many pups sprawled out on the backs of their mothers. An hour later we anchored back at Doubtful Bay. As a welcoming party two Polar Bears roamed throughout the buildings, one standing up to look into the window where our overland party were staring back at it. The landing was controlled and the rangers kept a sharp eye open for the bears as we explored the village once again, this time without any fog. The highlight was an Arctic Fox near the old building and a Snowy Owl up the river bed, a fitting way to end our time exploring this remarkable Arctic Island. We waved goodbye to our rangers, heaved anchor and set course back towards the mainland and into what promised to be some stronger winds. The forecast wind overnight and through the morning never materialised and we sailed south and into the narrow mouth of the vast Kolyuchin Inlet on calm waters. To our north Kolyuchin Island lay silhouetted whilst to the south, east and west the Chukotkan coastline sloped away in a soft, autumnal light. We landed in a small bay on the eastern sandspit where we were greeted by Alexey, an Ornithologist who spends his summers at Belyaka researching waders. We were able to explore at leisure for a couple of hours although a couple of groups were available for those who wanted to learn more about Alexey’s life at Belyaka or those who wanted to go birding. Next to the landing spot a cross marks the resting place of Belyak. 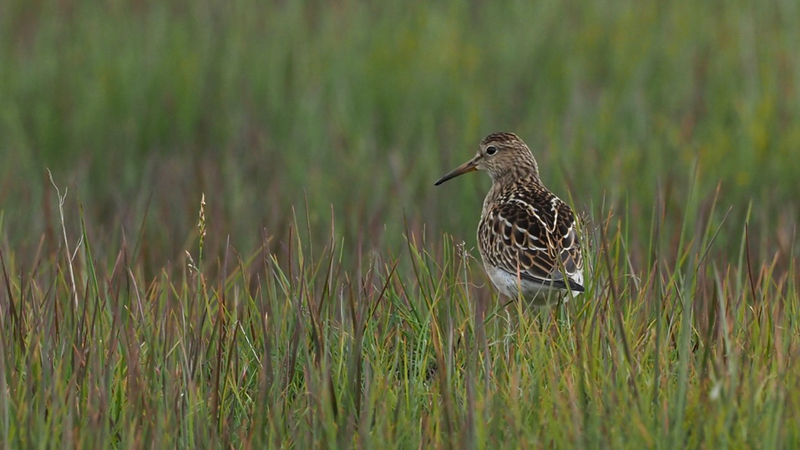 The birding group got off to a great start with a flock of juvenile Pectoral Sandpipers feeding in a muddy pool quickly followed by a pair of juvenile Buff-breasted Sandpipers, the first on the spit since 2005 and likely hatched on Wrangel. These tiny waders were just starting out on their southbound journey which will take them to South America. The Sandhill Cranes of the region had also started on their migration and a flock of 39 flew in across the bay to the north landing on the spit. Much like the sandpipers these will be heading for the New World. The pools at Belyaka provided a perfect breeding location for Pacific and White-billed Divers and we found both species each with a small fluffy chick, a highlight for many. Two small flocks of Emperor Geese proved a very pleasant surprise not to mention striking with their gleaming white heads and silvery bodies. This Beringian endemic can be a difficult species to catch up with. The groups reconvened at Alexey’s hut and with the ship having relocated around to the north side of the spit we were shuttled back onto the ship to continue our voyage east along the north coast of Chukotka and towards the Bering Strait. We woke to a smooth passage through the Bering Strait with Big Diomede sitting to our port side and a sliver of mainland Alaska (the top of Prince of Wales Mountain) just in view beyond it. As we continued south we arrived at the mouth of the Lavrentiya Gulf once again, and were soon greeted with a number of Gray Whales. Over the next couple of hours around 25 of these gentle giants fed happily in the Gulf churning up great clouds of sediment which was promptly seized upon by small flocks of Red-necked and Grey Phalaropes as well as Short-tailed Shearwaters and kittiwakes. The ship slipped passed Lavrentiya and further up the gulf continuing through more whales and seabirds. A Gyr Falcon belted down the starboard side of the vessel and Erige picked up three distant brown bears. We came to a halt in a sheltered bay, its name, No Name Bay. After lunch we shuttled ashore in glorious sunshine and 18oC for the chance to explore this beautiful area of the Bering Strait. Three groups set out. Alex led a long walk skirting up the protecting peninsula to our east and along to the high point that Dan had lead a group up. From the summit we had stunning views out over the bay, the gulf itself, the sheltered lagoon and the braided river beneath right up to the snow-mottled peaks inland. Small flocks of Sandhill Cranes continued their migration south and east, no doubt heading towards a narrowing between Eurasia and North America. The landscape was breath-taking; big sweeping valleys and lunar-like hill tops devoid of vegetation. The long-walkers enjoyed views of two brown bears fishing in the river, one of which caught a Salmon and proceeded to lope across the valley base towards the group before devouring it. The transition between summer and autumn was evident. Flowers still bloomed but the first of the Lingon and BearBerries were ripening and a yellowish cast had befallen the vegetation. After a very enjoyable three hours ashore we waved goodbye to the bay and headed back to the ship where we enjoyed a tranquil dinner in the shelter of the gulf before setting off south late in the evening. A warm breeze wafted through the ship this morning and we enjoyed several brown bears sighted near an old whale carcass. 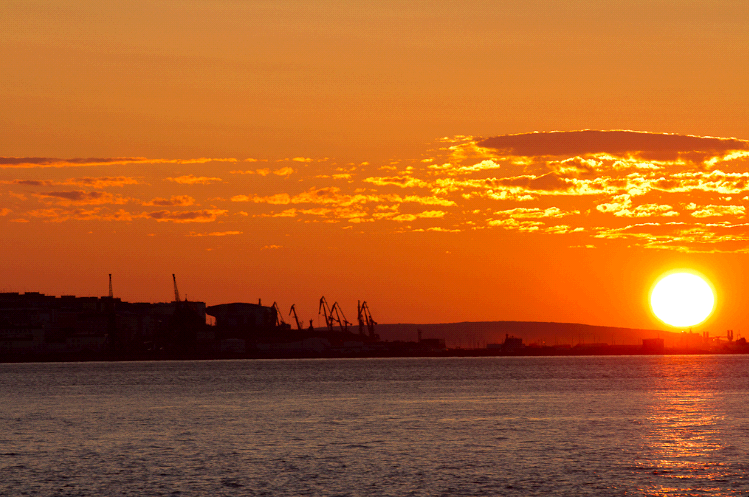 It was a good start to another sunny summer day in the Russian Far East. Soon after we passed the bears, we started seeing whales in great numbers, and before we knew it we were in the Zodiacs amongst them. The day was ideal for whale watching and more then 30 humpback whales were energetically feeding and surfacing around our small boats much to the enjoyment of everyone aboard. The Zodiacs spread out, each quietly watching its own group of whales with every boat getting a special encounter as the Humpbacks surfaced close by often swimming under the boats to look up at us. There was an odd whale in the group and it turned out that a North Pacific Right Whale was swimming and feeding amongst the humpbacks. An extraordinarily rare whale, this Right Whale has a world population of fewer than 200 animals. With few visitors to the area, these animals are very rarely sighted. It was an extra special treat at the end of a remarkable trip. Several animals could be seen breaching as we wrapped up our cruise amongst the whales and multitudes of Tufted Puffins. Over lunch the ship repositioned further into Pengingay Bay to get some shelter from the breeze that had picked up. Everyone came ashore in the afternoon for a leg stretch up the hill behind the beach, or some time to relax in the beautiful surroundings. When we arrived, a Wolverine was spotted on the hill, another rare animal to see anywhere in the world, and another first for many onboard. As the hikers climbed to the summit, guests could be seen below spreading out, birdwatching, and going for a swim in the ocean. It was a wonderful last landing before commencing our journey back to Anadyr. Once all the Zodiacs were back onboard, the ship set sail south, and as we cruised through the area we were in through the morning, the North Pacific Right Whale was spotted again, whilst the Humpbacks could be seen breaching and lob-tailing. We ended the day with a recap, only to have it pleasantly interrupted by a group of Gray Whales right before dinner as the sunset behind them, a fitting end to a brilliant day. After days of getting up early for adventure, today Helen let us all sleep in a little bit extra on our day at sea. A day at sea at the end of a trip like this is always welcome. It allows us all to wind down, take a deep breath, to begin to digest what we have seen, and get ready to return to our normal lives. Housekeeping tasks were taken care of, those wonderful Muckboots were returned, and accounts settled. Oxana gave a presentation in the morning on the festivals of the Chukchi people which followed from the movie played the previous night. Dan then gave a presentation before lunch on whales, offering further insight on the animals we got to experience yesterday. After a lunch we had our disembarkation briefing, and time to pack before an evening at the bar and a chance to catch up before we all go our separate ways. Finally, a farewell dinner was served, a feast that appropriately celebrated the end of an exciting adventure across the top of the world. We disembarked the Professor Khromov in the morning and commenced our travels homeward. Most of us arrived in Anadyr in one of two main groups, one coming from Moscow and another arriving in two flights from Nome, Alaska. The airport was located opposite the town of Anadyr, across Anadyrskiy Bay and a barge took us and our luggage to the city and the ship, respectively. White Beluga Whales were easily seen against the dark waters of the bay and there were also a number of the more inconspicuous Larga Seals. Most of us had a few hours ashore before boarding the ship and we used the time to explore the town, looking into shops, the museum, cafes and admiring the beautiful wooden church above a sparkling bay. The sun was out and the weather was unusually warm, actually sweltering by local standards. In the late afternoon the barge collected us again and shuttled us out to our home base for the next two weeks' exploration of Chukotka and Wrangel and Herald islands. The Professor Khromov operating as the Spirit of Enderby lay at anchor in the bay awaiting our arrival. After we were all finally aboard, we gathered in the ship's lecture room for greetings and staff introductions. Our Expedition Leader, Rodney Russ, first introduced chefs Lindsay and Jess, our Assistant Expedition Leader Evgeniya, Cruise Director Meghan and guides Laurie and Nikita. Two other guides would be joining us later: Yulia was currently on Wrangel Island with a group of people who were staying there from the previous voyage and tomorrow Oksana would be picked from Yttygran Island. Rodney then introduced our shipboard physician Dr. Leo, a veteran of several voyages with Heritage Expeditions and an indispensable member of the team. Rodney then gave us a brief introduction to the ship and its operation and afterwards we went up two decks to the bar for drinks and to get to know our traveling companions before going down to the dining room for a late dinner. It had been a long day and most of us retired early. The seas were becoming rough as we left the shelter of the estuary and bay at Anadyr, so we left much of the unpacking and cabin-organizing for later. A glowing orange sun set off to starboard and the moon was already high in a dusky sky as the Spirit of Enderby moved out of the bay on its way north through the waters of the Russian Far East. We awoke to Meghan's greeting on the intercom this morning as the ship continued its northward journey through rolling seas. Breakfast was scheduled for 8:30am, allowing us some extra sleep after our previous long day. Conditions were a bit too rough for comfortable activity about the ship, so some items of business were postponed until later in the day when we could find some shelter from the wind and the waves. After lunch we anchored in the calmer waters of Preobrazheniya Bay and gathered in the lecture room where Rodney presented an overview of the expedition and explained what we could expect, which, as an expedition, included the unexpected. Rodney then went over the lifeboat drill that was to be held a bit later in the afternoon and covered the basics of how to board and exit the Zodiacs safely under different conditions. Later, at the scheduled time for the lifeboat drill and upon hearing the seven short and one long blasts from the ship's horn, the captain came on the public address system and instructed us to proceed to our muster stations. We donned lifejackets as instructed and went to the port or starboard station and climbed into the lifeboats to get a true feel for the whole procedure. It was a good exercise for all of us to be prepared for an emergency. The sea conditions remained too rough for a Zodiac cruise along the bird cliffs at Preobrazheniya Bay, but the ship remained close to shore and we could watch many species flying or floating near the ship: guillemots, Tufted and Horned Puffins, Crested and Parakeet Auklets, shearwaters, kittiwakes, Glaucous Gulls, and Pelagic Cormorants. We continued along the coast when Meghan announced the second order of business for the day: credit card imprints were taken and Evgeniya collected our passports. When that was concluded, the bar was opened and we enjoyed drinks and conversation until dinner time. Both the Cossack beef casserole and the blue cod with capers prepared by Lindsay and Jess for dinner were fantastic, and everyone — especially those who may have missed lunch due to the rough seas — filed happily out of the dining after the hearty meal that did not disappoint. The going was still smooth and we looked forward to a good night's sleep and an interesting day at Whale Bone Alley. This morning there were over a dozen Gray Whales between the ship and the shore feeding along the sea bed. The breeze and whitecaps made it a little difficult to see their blows, but patient observation rewarded anyone who took the time to watch for them to surface. The dark clouds and even darker mountains in the distance were dramatic and ominous, but the rain held off. Just after breakfast we met in the lecture room where Rodney briefed us on our plans for the morning. Just before the briefing he and Meghan had driven over to Yttygran Island to collect Oksana, a Russian cultural anthropologist who was introduced to us at the briefing. Oksana would be our guide to the cultural aspects of the region and its people and our first landing would be at Whale Bone Alley. We suited up for the short Zodiac ride to shore and were soon exploring the site. 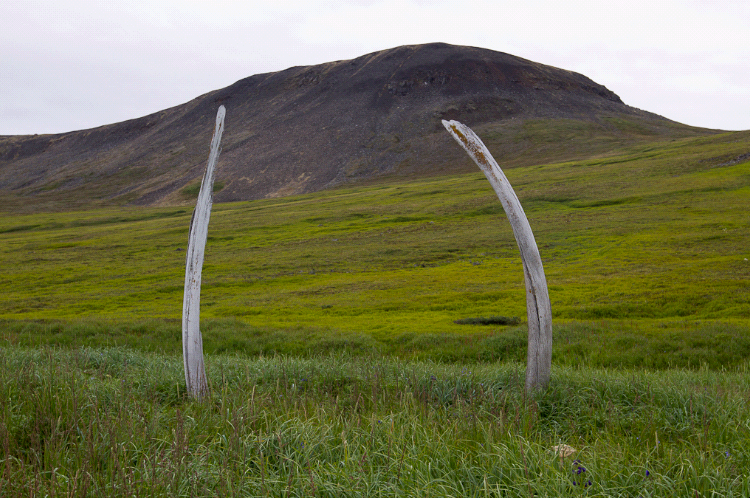 Whale Bone Alley on Yttygran Island is an ancient Eskimo ceremonial and hunting site that was given its nickname by the rows of paired whale jaw bones that form a kind of alleyway up from the shore. Most of the tall jaw bones have fallen down but about seven are still standing, anchored in the permafrost and wedged in with stones, giving an idea of what it must formerly have looked like. There were also a number of whale skull bones lined up at the top of the beach crest and behind two of these, as well as elsewhere around the site, was a stone-lined pit partially filled with soil and hidden by tall grasses. Carefully bending aside the grasses in one corner of the pit revealed the precisely stacked stones that still form a solid wall. Archaeological investigations of the area have discovered whale meat in the pits and they were thought to have been used as cold storage lockers for food. Tucked in amongst the lush grasses that blanket the area behind the beach were bluebells and monks' hood flowers, both beautiful rich shades of blue. Rising away from the flat, grassy area was a long, smooth expanse of tundra reaching up to a saddle between two low peaks. At the top of the saddle was a beautiful vista through a long valley down to the water on the other side, and off to one side was an area with graves marked by stones. All around the area were jumbles of rocks and boulders that serve as great habitat for shy Pikas (rabbit relatives) that could be seen best by patient observers who were willing to sit quietly in one spot for a time. Also amongst the boulders was a circular area defined by rocks that could have been a kind of council circle or meeting place of some significance. The size and shape of some of the rocks in the circle made perfect seats. Another briefing after lunch prepared us for an afternoon at Gilmymyl. Nikita led a wildlife walk while Laurie explored the tundra with the plant enthusiasts who did not cover much ground due to the ground being covered in sweet, ripe blueberries! Rodney led the hot-tubbing group through the tundra and along the river to where a rustic wooden soaking tub had been built to collect the thermal waters from the hot springs. The water temperature was 33.5 degrees C, so after warming up in the tub, a few people cooled down in the shallow river running alongside. Closer to the lagoon where we landed, Oksana took a group to visit Ivan, a local Chukchi fisherman who had his summer camp there. He graciously showed us his house and pet Arctic Ground Squirrel that scampered under our feet and posed for photos. Ivan told us that a Red Fox had a den and some kits under one of the out-buildings, so a few people went off to see if they could spot them. Soon after we returned to the ship the bar opened and we gathered for drinks and chats. A recap of the day followed, with Rodney and Oksana leading off with some background on the people and history of the area. Laurie explained what tundra vegetation was and pointed out that the kind of tundra here was ‘southern’ or ‘shrubby’ tundra that had a greater abundance of woody species than more northern tundra, including a species of Alder. Some of the notable birds of the afternoon included the elegant Sandhill Cranes and a White-tailed Sea Eagle. To conclude, Rodney briefly outlined the plan for the landing at Cape Dezhnev, 119 nm away. It was then time for dinner and an early night for most. This morning we arrived at a windy Cape Dezhnev or ‘East Cape’ as it was historically known. After fortifying ourselves from the breakfast buffet, we met in the lecture room where Rodney gave an introduction to the former village of Naukan that was located there. The site had been occupied for at least 2,000 years until 1957 when the residents of Naukan were relocated to other settlements by the Soviet government. From the easternmost shore on the Eurasian continent where we landed, it was a steep climb up the trail that ran alongside a rocky stream to the former settlement. At the top, on either side of the stream, were the scattered stone foundations of numerous dwellings. There were still vestiges of the original roofs that had huge whale bone rafters spanning the width of the houses; the more modern roofs had wood supports. On the monument side of a steep gully were wooden buildings in every state of collapse, some barely clinging to the edge of the cliff. A porch had detached from one and was scattered down the cliff face. These houses had been used by government officials during Soviet times. The wind was very strong and the swathes of long grasses covering the site rippled like the waves on the sea below. It looked as if the people of Naukan had left in a hurry as many rusting tubs, pots and kettles remained scattered over the site. Whale jaw bones still stood upright in a few places along the cliff edge. Old photos of the site showed skin boats upturned over the pillars to keep them off the ground. From the sea, the tall white bone pillars would also have served as markers for landing sites. The whole place, however, did not seem to be the most convenient location for a settlement; perched high on a cliff, boats likely had to be pulled up some distance because they could not have been stored safely on the narrow beach. Moreover, the dwellings must have been fully exposed to the elements. The exposure however, gave the inhabitants a 180 degree + view of the Bering Strait, so for a community dependent upon finding and hunting whales for survival, the location was ideal. Our view from the top included large flocks of Eider Ducks flying south, which we were told, portended an early autumn. Short-tailed Shearwaters however, were flying north, and we also spotted the dark grey head of a Bearded Seal bobbing among the white caps below. Oksana had been many places in Chukotka but this was her first time at Naukan. It is an Eskimo custom that when visiting a deserted settlement, one should offer a tribute to give thanks and express appreciation for being able to visit. Oksana had forgotten to bring something with her, but Sue generously offered up a couple candies and a beautiful blue stone she had with her. The tributes must have been acceptable because not only did we have a wonderful time exploring Naukan, but the seas had been quieted substantially by the time we had to depart and we all made it safely back aboard. 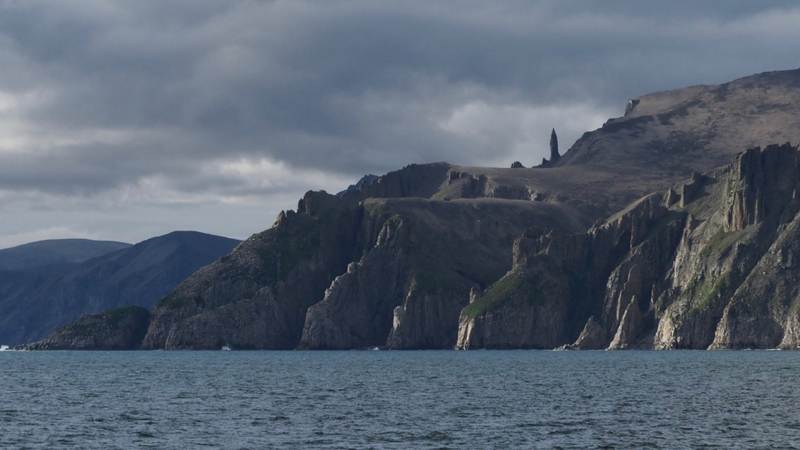 We cruised close to Cape Dezhnev as we headed further north towards our next destination. Communication from contacts in the nearby town of Uelen indicated it was too rough for a landing there, so we continued directly on to Wrangel. The afternoon programme began with a lecture from Oksana on Beringia National Park as the Spirit of Enderby headed north through the Bering Sea. Oksana had just started working for the Park which consisted of large separate areas throughout the region with various levels of protection that ranged from completely protected, to areas for restoration or multi-use. The size of the park is enormous: 1,819,454 ha, or about 4.5 million acres. It is a relatively new park and its operation, resource management and the education of the local residents, were still works in progress. Nikita's presentation later that afternoon entitled ‘An Introduction to Wrangel Island’ served to increase our anticipation of visiting this UNESCO World Heritage Site. Wrangel Island has been a strict nature reserve since 1976. In 1997 a 12 nm wide protected marine area was added around the island and in 1999 a further 24 nm wide buffer zone was added. Altogether the 36 nm wide marine area with the terrestrial part of the Reserve encompasses 57,000 square kilometers of land and sea, connecting ecologically linked zones and preserving an intact ecosystem. The island is very diverse with rivers, mountains, lagoons, lakes, tundra, rocky coasts, sandy beaches and all other arctic landscape elements with the exception of glacial features. Many things make Wrangel Island unique, among which is the fact that species have been present and evolving uninterrupted there for millions of years because the area was never glaciated. A dwarf mammoth lived there as recently as 3,500 years ago, and there are 417 species of vascular plants. This is two to two-and-a-half times as many as in other comparably sized Arctic areas. 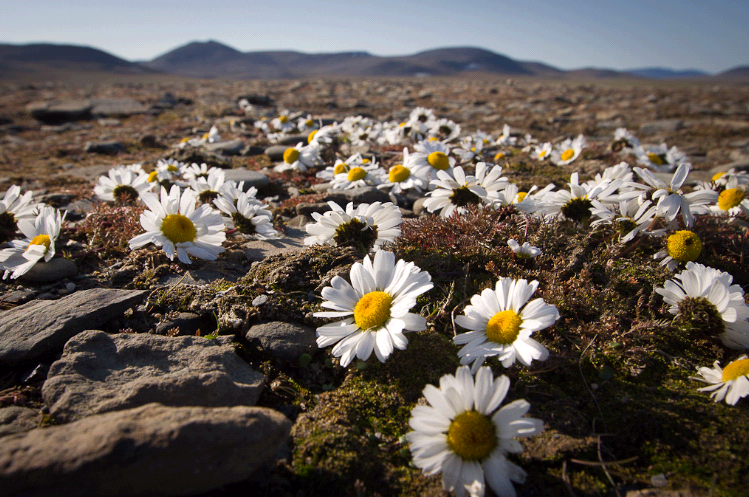 That number also includes 23 endemic species, plants that occur on Wrangel and nowhere else in the world. The island is no less unique for its wildlife and boasts the only surviving Snow Goose nesting colony in Asia with an estimated 60,000 nests. It is also an important nesting area for Snowy Owls. Drinks, dinner and a well-earned night's rest were next on the agenda. Breakfast, we were told, was scheduled for later than usual, giving us time to sleep in and recharge our batteries for tomorrow's adventures. Today was spent at sea as we made our way through the Chukchi Sea and across the DeLong Strait. After breakfast Nikita showed the documentary he filmed while living alone and studying polar bears at Cape Blossom on Wrangel Island. ‘Life on the Field of Bones’ gave us a fascinating look at the life and behavior of this marine mammal as it comes ashore to live in an ‘unnatural’ terrestrial habitat during summer when the ice retreats far from land. Wildlife watching from the bridge yielded the sighting of one male Orca or Killer Whale. The males are identified by their large dorsal fin. In preparation for our visit to Wrangel, Nikita presented his Polar Bear safety talk to instruct us how to conduct ourselves around the animals keeping both them and us safe. He is trying to change the way most of the Arctic regards and reacts to perceived threats from Polar Bears and points out that on Svalbard guns are the ‘safety plan’ of choice. One very telling statistic was that on Wrangel, where there are the most Polar Bear v human encounters in the Arctic, no one carries a gun, no Polar Bear has been killed and no human has died. Conversely in Svalbard everyone carries a gun, many Polar Bears have been killed and several people have died. 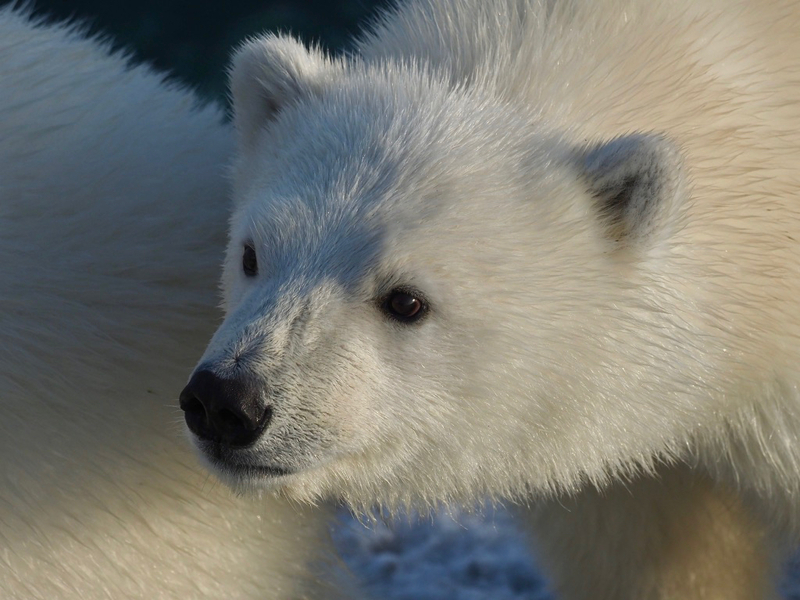 Nikita's behavioral observations of Polar Bears have revealed that they are very predictable and easily managed by following simple rules which protect both bears and people. We then viewed a video prepared especially for us by Jennifer Niven, author of ‘The Ice Master’. Jennifer was to have travelled with us on this voyage for the 100th anniversary of the sinking of the Karluk, but was unable to join us at the last minute. She recorded her lecture so we could still hear the story of her research and writing of the book and her personal journey from its inception to her own visit to Wrangel Island in 2005. 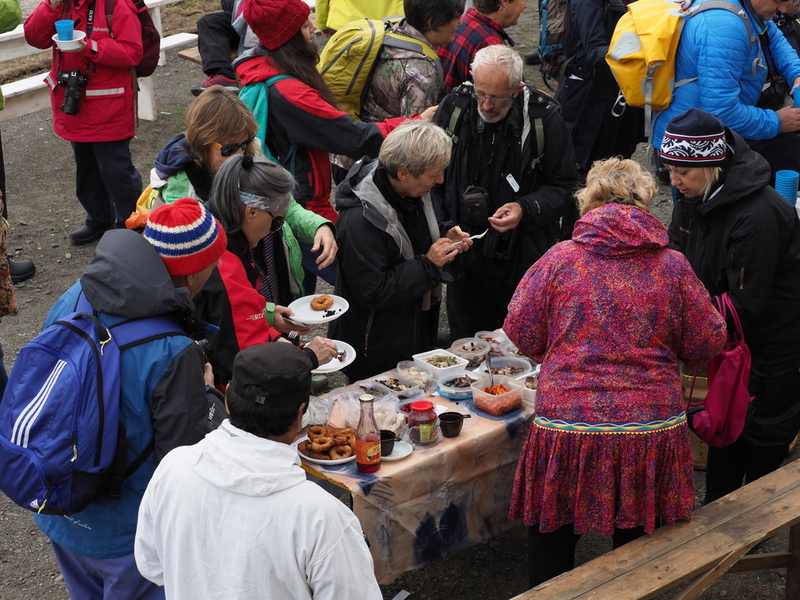 A briefing was held before dinner for the five ‘Overlanders’ who would be leaving us and living on the island accompanied by Oksana and staff of the Wrangel Island Reserve. They would cross Wrangel Island, staying in the same cabins that the rangers and researchers use and would rejoin us on the ship in three days’ time. We encountered beautiful bright sunshine as we anchored off Doubtful, one of the two main settlements on the southern coastline of Wrangel Island. Here we met up with Wrangel Island rangers Olga and Denis and researcher Irina, who would accompany us during our visits to the Reserve. We also greeted the ‘High Arctic Expeditioners’ who had remained on Wrangel Island from the previous voyage and would now rejoin the ship for the rest of our voyage. They had arrived at Doubtful in the balloon-tired ‘Trekol’ tundra vehicle the night before and had stayed overnight, awaiting our arrival. There were a number of old houses and one newer building at Doubtful that serve as residences for the researchers and staff who live on the island seasonally or year round, and also for housing visitors. Farther back from the houses and down what constituted the main road were the remnants of a Soviet-era military installation and airstrip from the late 1960’s, with rusting metal buildings and the omnipresent fuel barrels. 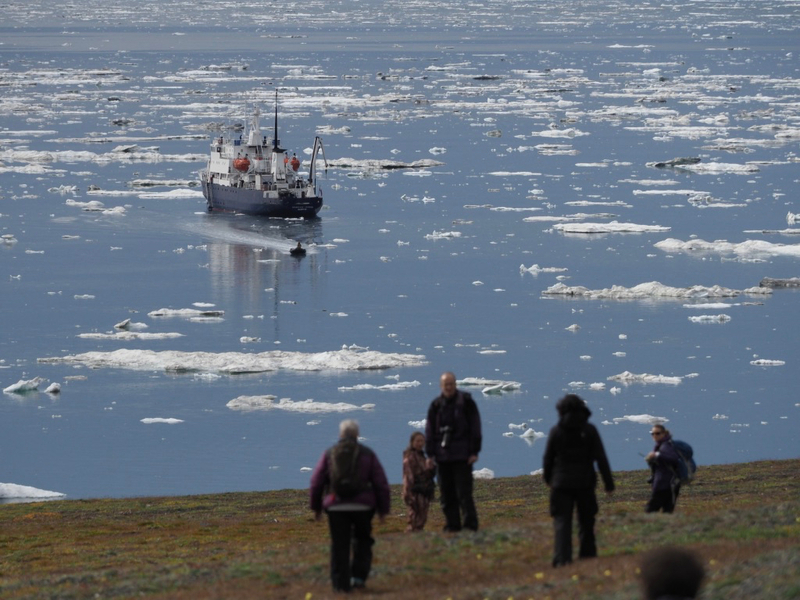 People divided up to explore the area with staff from both the ship and Wrangel Island. We headed down the road or up the riverbed and across the tundra in search of wildlife and wildflowers. Irina remarked that over the past several days they had had beautiful warm weather making swimming in the river near her camp delightful. The heat however, had dried out the vegetation and the plants were struggling from the lack of water although many species, such as the Forget-me-nots and Arctic Poppies, were in flower everywhere. Wildlife spotting resulted in a pair of Musk Ox at a distance, many Pomarine Skuas and a Plover with chicks. The groups made their way back to the landing site along the beach. Offshore, floes of ice slowly drifted by and we scanned them with our binoculars in case a bear or group of walrus were among them. We returned to the ship with the High Arctic Expeditioners and bade farewell to the Overlanders who left us for their three-day island crossing. 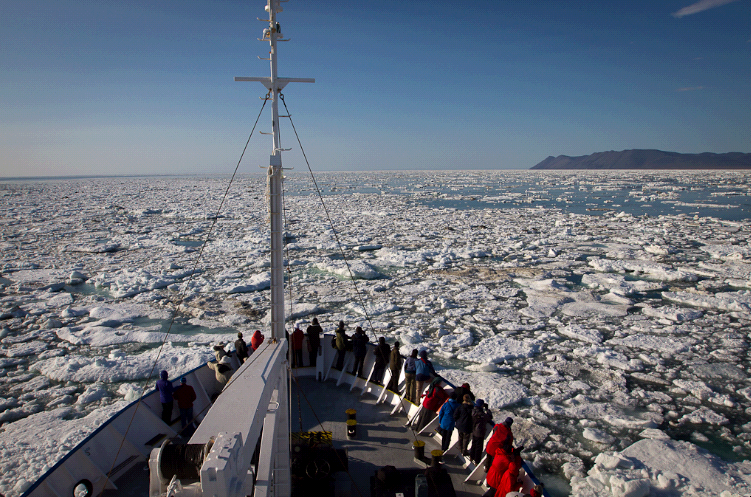 We tucked into lunch as the ship sailed off in search of a promising stretch of ice for more wildlife viewing. After lunch most of us were either on deck or on the bridge with binoculars, scanning the bright white ice for signs of life. Both the hot chocolate served on the bow plus a prize offered for the first sighting of a Polar Bear, encouraged everyone to be out looking. It was not long before a group of Walrus was seen piled on an ice floe, so we launched the Zodiacs to see if we could get closer to them. Not only were we able to approach the Walrus without disturbing them, but Meghan spotted the first bear, or rather ‘bears’ as there were five of them, including two-year old cubs. Although they were wary, their curiosity meant we were able to get some excellent photos of the group as they watched us for a good while. The temperature was dropping and the bears moved on, so we returned to the warmth of the ship and a late dinner. Lindsay and Jess had both been out cruising with us but still managed to provide a tasty meal. Seas were calm all night as we made our way around Wrangel Island to Komsomol Lake. Right after breakfast and a briefing, our planned excursion was temporarily delayed by a Polar Bear at the landing site. We waited and after a while the bear moved off so the coast was clear for landing. Down the gangway and into the Zodiacs we filed and motored over to offload in front of a small cabin between the beach and Komsomol Lake that spread out at the base of a foreboding dark line of mountains. The structure was a typical hunter's cabin and had been used by a man who lived there with his family and trapped Arctic Fox along the coast. He also hunted Walrus and seals to eat and to bait the fox traps and was the last person on the island to make the traditional walrus skin boats called ‘Baidaras’. The cabin was exposed to the worst that nature could throw at it from every point of the compass. Nikita showed how sheets of a kind of roofing material were fixed to the outside walls to seal any possible opening that would let in the wind or snow. The windows were shuttered and metal grating or spikes protected other potential points of ingress from inquisitive Polar Bears. From the cabin we could easily see a female bear with two cubs resting together on the far side of the lake. The three of them remained there almost the entire morning. At the cabin we divided into groups to go exploring. Nikita headed off in one direction to spot wildlife and Laurie set off in another to explore the tundra. Irina, Olga and Denis joined one group or the other. The landscape seemed rather severe and we were told that the area received very little snow in winter. Without a protective layer of snow, the vegetation showed the effects of the extreme exposure; plants were low and scattered, and the tops of the sprawling gnarled trunks of the willows had been worn smooth by wind, sand and ice abrasion. Offshore we watched a lone Gray Whale feeding and nearby there were three female Eider Ducks with ducklings, as well as a large flock of Long-tailed Ducks. On a distant mountainside we could see two Polar Bears lying in day beds in a large patch of snow. They remained still for a long time, but eventually one of the bears approached the other who then got up and let the approaching bear have its bed. Later the second bear went back up to its original bed and the two switched positions again, ever so politely, it appeared. Nikita said these could have been females or males, as both sexes often pair up and interact very peaceably. The afternoon was spent in the area of the Sovietskaya River that empties into the East Siberian Sea on this side of Wrangel Island. Rodney led the serious hikers on a long walk and returned with a report that ten Polar Bears were seen at a distance, in addition to an Arctic Fox and several Snowy Owls. Nikita took a shorter route but still covered a lot of ground and tallied about seven bears. Laurie's relaxed hikers went up a nearby ridge and followed it parallel to the beach to a small ranger's cabin that consisted of a tiny metal caravan with a wood addition. Irina opened up the cabin so we could take a look inside. It was very cozy with artwork on the walls, decorative carvings made by various visitors on small shelves and a guest book with notes from people who had stayed there. It was getting colder as everyone eventually made their way back to the landing site after our long exploration of the area. Donning life jackets we loaded up and were soon back aboard the Spirit of Enderby. A quick cup of tea or a drink at the bar was all we had time for before dinner, which was early so we could get in a Zodiac cruise along the bird cliffs at Ptichy Bazaar as the sun was setting. At 8pm we set out for the nearby cliffs. The seas had calmed since the early afternoon and the light was perfect for photographing the myriads of Black-legged Kittiwakes, Black Guillemots, Horned Puffins and Pelagic Cormorants nesting or sitting on every available ledge or crevice on the rock face. Huge stranded icebergs and smaller floating blocks of ice provided additional perches. As the sun sank lower and lower, more and more birds gathered in the sky and on the sea. Large rafts of Black Guillemots undulated with the waves and the birds would stream away at our careful approach, but then turn back and swim towards us as their curiosity overrode their caution. As we were heading back to the ship, a three-quarter moon shone over Wrangel Island, while a glowing orange sun sank offshore, a serene close to a very full day. There was a layer of fog resting on the top of Little Dreamhead Mountain on the coast this morning. It did not seem to lift at all during breakfast, but at least it was not settling lower and visibility was still good. Rodney briefed us at 8:15am about our planned outing for that morning and we were soon in the Zodiacs and driving along the shore. However, we all know what is said about ‘the best laid plans...’ and we could not have planned for a better morning that was nothing like what had been planned! We first had an excellent view of a mother and two-year old Polar Bear cub on the shore that sat and watched us with as much interest it seemed, as we sat and watched them. After they became sufficiently bored with us and moved back behind the beach crest, we continued farther down along the coast and spotted a lone Reindeer. 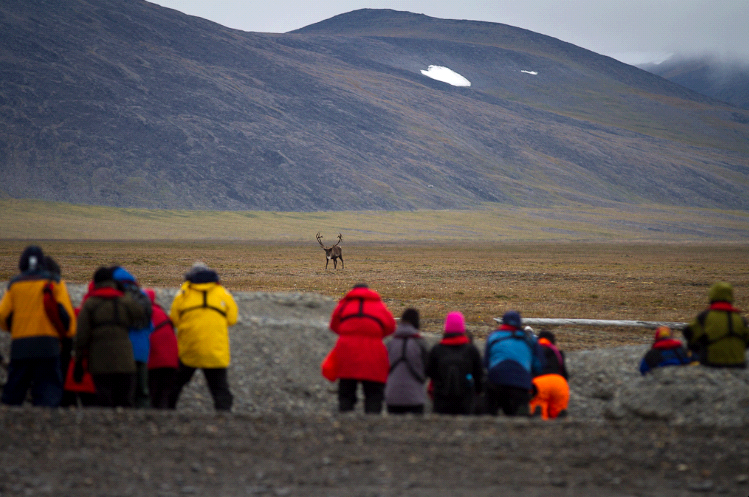 There are very few Reindeer on Wrangel Island so it is unusual to see them. This individual sported a huge spread of antlers from which the velvet was still hanging in long shreds. He would alternatively trot a short distance or graze a bit and then stand and stare at us staring at him. We quietly landed the Zodiacs and got out on the beach with instructions to keep just our heads above the beach crest to watch and photograph the deer. We stayed low and remained quiet and got some very nice photos of the animal out in the tundra. 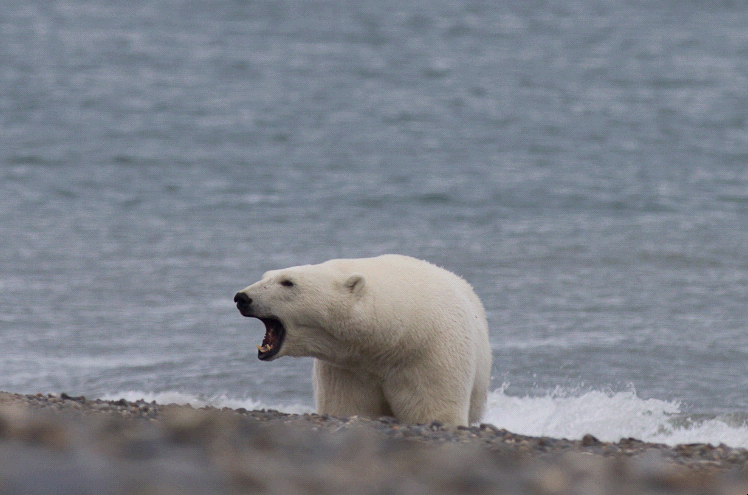 While we were observing the reindeer, a Polar Bear was seen far down the beach and walking our way. It was likely the bear would come much nearer so we closed ranks and squatted down on the sand above the beach and kept very quiet. The bear, a big beautiful female, came closer and closer without noticing us. Finally, she stopped and smelled the air and you could see that she was thinking as she caught our scent. Then it must have registered that this smell was something to avoid and she turned around and loped away, but not before we all had had the thrill of our lives being so close to this iconic mammal of the north. At Dreamhead we welcomed aboard the Overlanders who had been driving across the island and enjoying the spectacular landscape for the past three days in beautiful weather. Denise mentioned that one of the most interesting aspects of the overland trip for her was staying in the cabins and experiencing how the rangers lived while they patrolled and worked in the Reserve. The new houses that were being built seemingly everywhere were much less attractive and seemed out of place. At lunchtime the inbound and next outbound group of Overlanders exchanged places; we would meet up with the newest five Overlanders in three days' time on the southern coast, at Doubtful. We celebrated Margaret's birthday today at lunch with a beautiful chocolate and caramel cake prepared by Jess. With a small gift from the staff and a hearty rendition of ‘Happy Birthday’ from everyone, Margaret took a deep breath and blew out the single candle after making a wish and we all shared some of the cake with her. In the afternoon Nikita presented his lecture on the future of Polar Bears by prefacing it with some background on the species' innate intelligence and adaptability. Bears survive extreme environmental changes regularly in their lives by changing feeding and social behaviors with the seasons. The species evolved over tens of thousands of years of past climatic events, including warm periods, and adapted and survived. The present warming trends, however, confront them with the additional pressures of human impacts such as pollution, hunting, disturbance and increased contact in shrinking areas of habitat in which the bear is usually the loser. From over 300 maternity dens on Wrangel and Herald Islands in past winters, only 30 dens were recorded recently. Fewer and fewer cubs survive and adults regularly appear in underfed, stressed conditions. If sustained and serious protection measures are not implemented, the Polar Bear will likely disappear within 20 to 25 years — just one bear generation. By late afternoon we arrived at Nakhotka Island, a small flat piece of land that is an extension of the northern Tundra of the Academy of Sciences on the mainland. The rough seas, poor visibility and very difficult landing conditions did not allow for a visit, so we continued on towards Herald Island. That evening Rodney, Laurie and Nikita recapped some topics related to our latest experiences. Rodney summarized our progress so far on Wrangel Island. Then, because we had recently seen some of the last ice of summer, Laurie explained the ecological role sea ice plays in supporting the base of a marine food chain that culminates in whales and Polar Bears and the repercussions when there is no longer this foundation — literally and figuratively — in the Arctic Ocean. Nikita followed with some history of the Reindeer on Wrangel, which were introduced to the island in 1948 and again in 1952. Our lone Reindeer sighting earlier in the day was rare these days, but back in 2004 there were about 8,000 Reindeer on the island. However, a series of winters with warm spells caused ice to form on the tundra vegetation that killed thousands of animals, but it was not because the deer could not get at the food. The Reindeer could easily get to the frozen grasses and lichens, but the amount of ice that they ingested along with the food affected the bacteria in their stomachs and prevented digestion. The deer would actually starve with their stomachs full. Thousands of Reindeer were lost and the herd is only now slowly recovering. Morning dawned cold, windy and foggy, with the thermometer reading a chilly 5 degrees C. The ship had reached Herald Island during the night and we were anchored offshore trying for a little protection from the strong easterly wind. Right after breakfast we had a briefing from Rodney about Herald Island and our morning's plan: Zodiac cruising along the shore with a possible landing on one of the tiny beaches. Captain Kellett discovered the island in 1849 and named it after his ship the Herald. There is a vivid account of one expedition with a Herald Island connection by Jennifer Niven in her book ‘The Ice Master’. The ship Karluk was crushed in the ice and sank 50 miles north of Herald a hundred years ago on 11 January 1914. Four of the crew decided to leave the ship and came to Herald, thinking that it was Wrangel Island and were never seen alive again. Twenty years later a vessel found the remains of a camp on a small beach on Herald Island and a newspaper article reported their findings. The campsite artifacts included bones, pemmican, snow goggles and a belt buckle. There was also ammunition and a 30-30 Winchester rifle with the initials ‘BM’ carved in the wood. The other story related to us with a Herald Island connection (and much more positive outcome) was Nikita's narrative of his time spent on Wrangel with his wife Irina, studying Polar Bears in the early 1990s. Herald Island is what remains of the western wall of ancient Herald Canyon that ran along the eastern side of Wrangel and Herald islands. 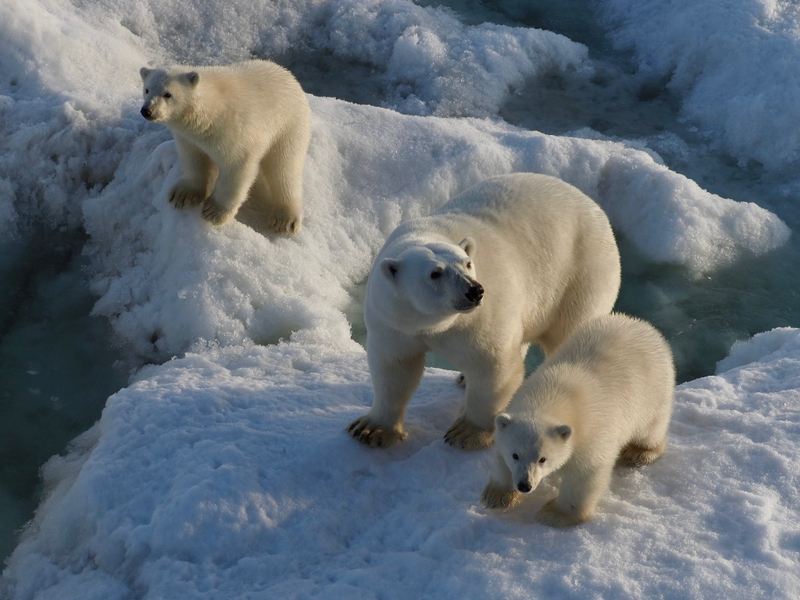 Polar Bears hunt on the surrounding ice and females come to the island to den. During their stays on Herald Island, Nikita and Irina recorded the greatest concentration of Polar Bear dens ever found in the world at 12 dens per square kilometre. The island is ideal for maternity dens with its steep cliffs and terraced top with good snow accumulation — perfect places to bed down for the winter. Presently however, due to the warming climate and shrinking ice, few females den on Herald because by autumn, when they would normally come ashore, the ice has retreated too far from land for them to conveniently reach it. Herald Island is also far enough from most shipping routes so few people ever reach it either, so we were fortunate to be among those able to do so. The wind strength and direction would not permit a circumnavigation of Herald, but we traveled the length of its rugged western coast. Dense fog laid like a blanket over the top of the island, but the visibility at sea level and almost to the top of the rock wall was clear. The island is a sheer cliff face, a wedge of solid granite pointed into the northwest wind with a spine of rock wedges and pinnacles that make it look like the backbone of some scaly reptilian monster from an ancient epoch. One person asked if the bears were able to even access the island up its steep sides. The bears themselves answered that question as we soon saw one, and then several others, high up the seemingly inaccessible cliffs. As we approached a headland we spotted about a dozen Walrus heads bobbing in the waves that could mean there was a rookery nearby. Taking precautions not to frighten the animals, we turned the Zodiacs out to sea and gave the gathering a wide berth. When we rounded the promontory we could see a small haul-out of Walrus on one of the tiny gravel beaches. We motored by slowly and made a brief landing on to a small beach so we could say we actually stood on Herald Island. After extensive photo documentation of our momentous landing we continued on to where the geologic formations along the shore provided footholds for nesting puffins, guillemots and gulls in various nooks and crannies, or a long ledge which ran the length of each fault. Then it was back to ship, lunch and Meryl's birthday celebration with another elegant cake by Jess. We headed towards Dragi Bay and Cape Waring on Wrangel Island in the afternoon, but the wind and the waves never abated so we could not make a landing. To get some relief from the constant rocking, it was decided to return to Herald for some lee and a comfortable evening. We enjoyed a couple films during the afternoon, one of which was Jennifer Niven’s narration of her book ‘Ada Blackjack’ and a documentary called ‘Blackfish’ about Orcas in captivity. We were grateful for the calm in the lee of Herald Island after a rough day at sea and turned in hoping for better conditions for our return to Wrangel early the next morning. The Spirit of Enderby left the protective anchorage off Herald Island in the wee hours of the morning and crossed over to Wrangel to see if it was possible to land at Dragi Bay. Unfortunately the wind and weather conditions had not changed so Rodney decided the better plan was to move westward to Doubtful. There we would pick up the second group of Overlanders and drop off the Wrangel Island staff who had accompanied us on our visit to the Reserve. During the morning the Reserve rangers Olga and Denis gave presentations on their work and research on the island. Later Irina gave an introduction to the biology and behavior of Snowy Owls, a species she has been studying over the past 30 years. There was also a short video of the nesting owls and their interactions with Arctic Foxes, Snow Geese and Eider Ducks which was very interesting. We reached Doubtful by lunchtime and people and their gear were transferred on and off the ship via a couple Zodiacs. Once the latest five Overlanders were back aboard, the ship had a full complement of passengers for the first time on our voyage. Our next destination was south across the Delong Strait and with both engines engaged, we started out for our next stop at Kolyuchin Island. Once we had been sailing for a while Meghan announced the opportunity for some retail therapy. The Sea Shop was opened in the port side dining room and one could choose from an assortment of clothing, postcards, books, pins, maps and other items from the ship's stores as well as handicrafts from Chukotka. A History Channel documentary on the Karluk was screened in the lecture room following the shopping spree. The social hour in the bar before dinner was very animated, with the Overlanders sharing stories of their experiences over drinks and snacks. Dinner was eventually announced and we dutifully filed down to the dining rooms for another delicious meal. The seas were calmer this evening, which made for more comfortable cruising and a good night's rest. After breakfast Oksana presented her research comparing the towns of Lorino and Sireniki with respect to their histories, ethnic composition, language use, celebrated events, hunting organizations and other cultural aspects. 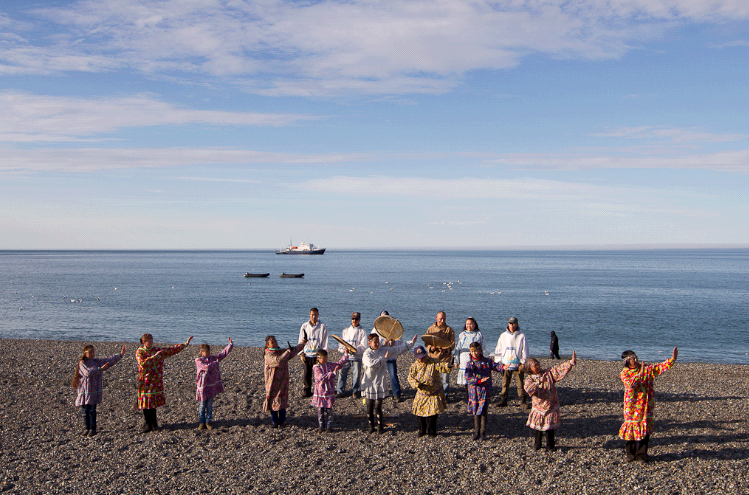 The population of Lorino is about 1,300 people, mostly Reindeer and Maritime Chukchi. The settlement of Sireniki is one of the oldest in the region, having been occupied for an estimated 2,000 years. Today the population numbers about 500 Yupik, Reindeer Chuckchi and ethnic Russians. Oksana conducted her research with interviews, questionnaires, literature reviews and her own observations to discover why there were such marked differences between the communities. Lorino for example, celebrated many events including ‘Whale Day’, a ‘Nadezhda’ dog sled competition and a ‘Beringia’ skin boat race. There were also strong differences in the membership, organization and administration of marine mammal hunting associations, with Lorino also showing more skilled leadership in this area. Her conclusions were that the differences were due to the presence or absence of local leadership, the settlements’ cultural histories and demographic compositions, consequences of Soviet State relocations and the geography of each settlement having to do with the harbour and ice conditions. Before lunchtime we were in Kolyuchin Inlet and headed for Kosa Belaka (Belaka Spit). Rodney briefed us on our outing: Adolf Erik Nordenskiold was here first on 28 September 1878, although the area had been known about and used by the indigenous Chukchi for centuries. The lighthouse back from the beach was erected in the 1950s, and there was also a large cross on the spit. The original marker had been established for a sailor from a 1911-1914 expedition and in 1942/43 a larger cross was erected to memorialize ships of the Northern Sea Route. A small cabin nearby was used by researchers during the summer season. We landed on Belaka Spit and wandered off in small groups for a relaxing afternoon just enjoying the landscape, exploring the lake edge, examining the tiny plants at our feet and bird watching. A large flock of Black-legged Kittiwakes was bathing in the lake and three species of divers (also know as ‘loons’) — Black-throated, Pacific and a White-billed with a chick — were cruising off to one side. Standing and preening on shore we saw a pair of White-fronted Geese. Along the beach we came across numerous large and small Wolverine tracks which indicated there was probably a family group in the area. The prints were very fresh. The beach sand around each track was damp, but the imprints themselves were dry because the sand had been disturbed. The animals had probably been there several hours prior to our landing so we hoped to be lucky enough to catch a glimpse of one. After trekking across the spit for a couple of hours we gathered at the landing site to shuttle back to the ship for a late lunch, unfortunately without a Wolverine sighting. The ship came about and we headed off towards Kolyuchin Island. Later in the day when we reached Kolyuchin Island, Nikita and Laurie were dropped ashore to check out the abandoned buildings on the top of the island and make sure there were no Polar Bears sleeping inside. We received the all clear message and boarded the Zodiacs for a quick shuttle to shore and a short climb up the slope to the site of an abandoned meteorological station that was closed in 1992. The birding and photographic opportunities were exceptional from up top, as one could look down and across at the guillemots, cormorants, gulls and puffins perched up and down the rocky ledges. We spent a couple hours exploring the site and enjoying the views of the distant coasts and mountains under a layer of clouds through which the sun would occasionally gleam far off on the horizon. While we explored up top, Rodney and Kostya reconnoitered the shoreline to check for Walrus. They found a large group of animals piled on a narrow beach and called everyone to the landing where we boarded the Zodiacs so we could approach and observe them from the sea. We had to keep our distance from the haul-out, but could still see them clearly from the boats. We estimated there to be about 800 animals in the larger rookery and a smaller group nearby. When added to the numbers in the water we decided there could be as many as one-thousand individuals in total. We observed the Walrus for a long time, but when the fog began moving in and the temperature started dropping we slowly and carefully withdrew from the group and made our way back towards the ship which had disappeared in the fog. She was finally sighted and we aimed for her dark hull in the grey mist. After a late dinner we were off to our cabins with the welcome news that we could enjoy an extra hour of sleep with breakfast scheduled for 8:30am the following morning. Overnight we continued southwards towards the small Arctic town of Uelen where we anchored early in the morning. We watched the first of a two-part film called ‘Inuit Odyssey’ provided by Oksana about the Inuit people, their history, migrations and culture. Before, during and after the presentation we had magnificent views of an estimated 20 Humpback and about 10 Gray Whales that were spouting and diving all around the ship. The Gray Whales were feeding close to the shore with the Humpbacks farther out. After two or three breaths a ‘Humpy’ would arch its back, showing the characteristic dorsal fin and then raise its tail flukes high as it dived down towards the sea floor. At times two individuals who were close to one another on the surface would dive together, which may have been by coincidence, or perhaps by mutual agreement. Rodney and Julia ran into shore to complete the formalities for our visit with the local border guards. The town of Uelen was spread out along a long spit with brightly coloured buildings lining the one main street. With permission granted for the group to come ashore, we filled the Zodiacs and arrived at the beach to a welcome by a few of the local children and adults. A larger concentration of people however, was gathered further down the beach around the carcass of a small whale. The young Gray Whale had been killed as part of a quota that each settlement is allocated for local consumption and had been dragged onto the sand by a tractor. The skin and fat were being flensed from the carcass and the meat divided among the people who carried away their shares in five-gallon buckets. Thick pads of blubber were being tossed into the sea and we asked why this was being thrown away. Oksana explained that the choicest part of the whale was the skin with a thin layer of fat attached. The excess was cut from the skin and thrown away because it took a lot of time and fuel to melt and process the fat and people no longer had much use for whale oil. We divided into two groups and took turns visiting the Walrus ivory carving museum and workshop and the local school. Later we gathered on the shore for a performance by the local traditional dance group. It was great to see all age groups participating, from kids to grandmothers and some of our group even joined in at the conclusion of the performances. The performance included a welcome dance and stories of seal hunting, Arctic Ground Squirrels and telephone calls. Chef Lindsay provided an encore with a traditional New Zealand Maori dance. Even with Oksana prefacing Lindsay’s performance with an explanation, the startled looks on the children’s faces showed they had not been prepared for such an exuberant recital! Back on board and up in the bar we enjoyed sharing our impressions and thoughts about the events of the day over drinks. Oksana was on hand to answer the many questions we had about the town, the dances and the whale hunt. It was soon time for dinner that concluded with yet another scrumptious dessert, this time Panna Cotta with passionflower sauce. We had been resolved to skip a dessert every once in while, but once again the temptation was too great and our good intentions were left for the next meal. For the Overlanders who may have missed Jennifer Niven’s recorded presentation of ‘The Story of Ada Blackjack’, it was shown again in the lecture room. It was interesting hearing her tell the tale of this remarkable woman who survived alone on Wrangel Island in the early 1920s. Laurie’s lecture entitled ‘Arctic Plant Adaptations’ followed the film and we learned how Arctic plant species managed to survive the harsh environmental conditions of low temperature, light and rainfall, a short growing season and strong winds. Arctic plants have to be adapted to survive not only long, cold winters, but they also have to have ‘freezing resistance’ that allows them to withstand periodic extreme weather conditions during times of the year when they are actively growing. The lack of this ability has prevented about 75% of the world’s 400,000 or so vascular plant species from being able to survive in the Arctic. Some interesting plant adaptations we learned about included the ‘cushion’ growth form that could be several degrees warmer than the surrounding air, large tap roots where up to 95% of a plant’s biomass might be stored safely underground and hairs covering leaves, stems and even flowers and fruit that served to trap air, insulate the plant’s tissues and increase its temperature to speed growth. After a short break, Nikita presented his talk on Walrus. The Latin name for the species is Odobenus rosmarus, which translates as ‘tooth-walking sea horse’. From a 1990 census, there were an estimated 225,000 Walrus in the world, divided into three subspecies: the Atlantic, Laptev and Pacific Walruses. The Pacific Walrus comprise about 90% of the world’s Walrus population, with the percentages of the Atlantic and Laptev subspecies comprising 8% and 2% respectively. There is very pronounced sexual dimorphism in the species, with males about 50% heavier than females and weighing up to two tons. Walrus are mainly bottom feeders, but they do not use their tusks to dig in the sea floor as previously thought. They feed on mollusks in waters from 2 to 70 m deep by scooping up mounds of mud with their front flippers and then finding the animals with their whiskers and sucking it out of its shell with their strong thick lips. They are also known to prey on seals. Walrus prefer to stay in small groups on the ice which reduces social pressures and also distributes them more evenly among their food resources. Most only haul-out on land when the ice has disappeared, but Atlantic Walrus, having not been hunted for a long time, haul-out on land even when ice is still accessible to them. On land Walrus are more exposed to predation by Polar Bears and more susceptible to disturbance by humans. We are careful around rookeries because they can spontaneously panic for little or no reason, but once settled on land, the animals usually become less nervous and stampeding them (which can crush and kill individuals) is less likely. Just before lunch we paused briefly in beautiful Provideniya Bay to disembark our guide Oksana, who lives in the town of Provideniya and two passengers who were returning to Nome from the city. Provideniya Bay is bordered by dramatic mountainscapes making it very picturesque with the city itself nestled in a small area between two of the peaks. With thanks and good wishes to Oksana and our two travelling companions we bade farewell and continued south. After lunch the second part of the documentary about Inuit history and culture entitled ‘Code Breakers’ was screened in the lecture room. The rest of the afternoon was spent catching up on sleep, reading, writing up notes, or enjoying the mild weather and sea conditions on deck as we continued south. Most of us were only half awake when we heard Meghan’s morning announcement which made us look at our watches and realize it was only 5:45am. Then we remembered Rodney had mentioned a pre-breakfast Zodiac cruise the evening before. After a quick cup of coffee and a croissant, we were down the gangway, into the boats and off to the bird cliffs. The tops of the cliffs of Preobrazheniya Bay are jagged with sculpted crags and spires, some tall enough to pierce the low layer of grey fog hanging just above the summit. Large, long swells rolled under the boats and into the vertical walls or stacked boulders at the cliff base. We saw three species of guillemots, as well as many recently fledged chicks out for their first swim. The Black-legged Kittiwake and the Glaucous Gulls had nearly full-grown young and we also saw at least two species of auklet, the Parakeet and Crested. The Crested Auklets gathered in large flocks that soared and wheeled synchronously in the sky, putting on quite a show and also congregating on the water. We also ticked off two new species for the trip, on this our last outing. Meghan spotted a small group of Harlequin Ducks and Laurie’s group saw a pair of Red-breasted Mergansers in a lagoon behind a boat landing they explored onshore. After the cruise along the bird cliffs we returned to the ship and flocked to the dining rooms for a most welcome hot breakfast. Most of the morning was spent wrapping up some items of business, returning gumboots and lifejackets, settling accounts and packing. In the late afternoon we were called to a disembarkation briefing in the lecture room. Rodney outlined the plan for the following day which, although fairly involved, looked like it should work in getting us and our luggage to where we needed to be at the right time for our flights to Moscow and Nome. He then extended his heartfelt thanks to all for their curiosity, enthusiasm and sense of adventure that made the expedition possible. Rodney also thanked the ship's captain, officers and crew for their patience and flexibility. Special thanks were also extended to Meghan and Evgeniya, chefs Lindsay and Jess and guides Yulia, Laurie, Nikita (and Oksana, in absentia) for all their hard work during the voyage. Dr Leo was also heartily thanked by passengers and staff for his kindness and care to all during our voyage. Meghan then presented a lovely compilation of photos of people and places and wildlife as a visual record of our voyage that was made available to everyone. Formalities completed, it was time for drinks in the bar and the farewell dinner. Jess, Lindsay and the staff had gone all out to make our last dinner aboard special. They had laid out an impressive spread for us to devour including delicious seafood, salads, side dishes, roasts, fresh salmon, cold cuts and all kinds of relishes. Dessert was a mouth watering ‘pavlova’. We all ate too much, but with such enticements it was difficult to pass up a bite of this or another small portion of that. Conversations with our companions and new-found friends continued well after dinner at the tables and up in the lounge until sleep, or the necessity to finish packing for tomorrow's departure, forced a retreat to our cabins. We arose to an early call to finish any last minute luggage preparations and fortify ourselves at the breakfast buffet for what would be a long travel day for most of us. Our pilot had come onboard at 5am so we needed to keep clear of the bridge, but from the deck we could observe the morning’s activities and the wildlife in Anadyrskiy Bay. With our bags outside our cabins for collection, we waited for the barges that would take us to the shore at our designated departure times. It was a little sad knowing our expedition was at an end, but our photos, experiences and memories would always be with us as reminders of our time on Wrangel Island and in this unique area of the Arctic, perhaps encouraging us to visit again.
" “Clearly and wholeheartedly I have to say that I LOVE Wrangel Island. It was not a love at first sight, as first sight of Wrangel Island was cold, foggy, and rather deserted from wildlife. We did not just do the tour around the island with several landings, but had the pleasure to stay on the island for 10 days. When you are ON THE ISLAND, meaning on the overland trips, which are additional building blocks Heritage Expedition offers …… the weather conditions change dramatically, the arctic is a desert, and then on land the micro climate provided for us sunny and warm days, with cool nights. And the island wildlife experience just exploded …… abundant snowy owls, jaegers, sandpipers, snow geese and other birds ( from all species always adults and chicks to see ), especially I loved the arctic foxes, we saw on each day dens, sometimes with up to 14 curious and for us photographers very cooperative and playful pups ! In addition there were a few rare reindeer to see and lots of muskoxen, plus lots of polar bears. Next to the animal life, there was also obvious the – for arctic regions - rich and colourful plant life. On the trip from Anadyr to Wrangel and back (10 days), plus on the two time 4 days circling Wrangel Island I took ca. 4000 images ( in combined 18 days ) and on the 10 days on Wrangel I took 12 000 images alone ! This clearly shows the beauty and power of this place. For this reason I definitely plan to return to Wrangel in one of the next years again with Heritage Expeditions, again with a dedicated group of nature wildlife photographer friends ! It was a real pleasure to experience this magical place, I had thanked Rodney Russ, the owner of Heritage Expeditions and our mega capable expedition leader on this trip plus Alexander Gruzdev, the Wrangel Island Nature Reserve Director, several times, for working so hard together to make this trip possible for our group ! All of our group was clearly aware of the multiyear ( !!! ) efforts by Heritage Expeditions which were needed to put this trip finally in place and that we were mega mega mega fortunate to be the first group to experience this arctic gem so closely and so extensively. I realize each day more, since I am back, how special this trip was / is !!! One of my friends has been on trips to the high arctic 8 times and already after 1 day on Wrangel Island he said to me that this trip is his best ever. It is logic that for this region you need a long lens or a camera with good digital tele zoom. 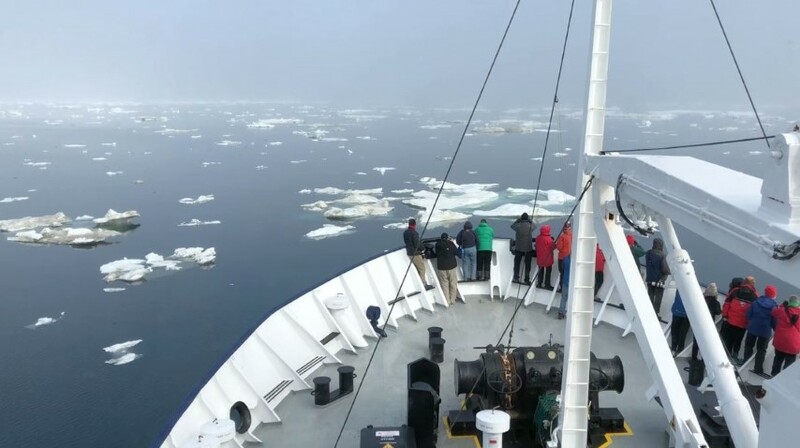 When we spotted polar bears on the ice, the ship stopped and zodiacs were within 10 minutes in the water for all passengers to have a chance to get as close as possible to the wildlife. One evening the ship manouevered itself near to a relaxed polar bear on ice and stopped there for several hours ( over dinner ). After dinner the bear actually was curious enough to come maybe close than 50 m to the ship and passengers were making full frame images of the bear in beautiful sunset colours with their smartphones !!! This is nature expedition at its best, always come prepared properly with proper gear ( as mentioned above ) and then also always a bit of luck is required for finding cooperative wildlife !